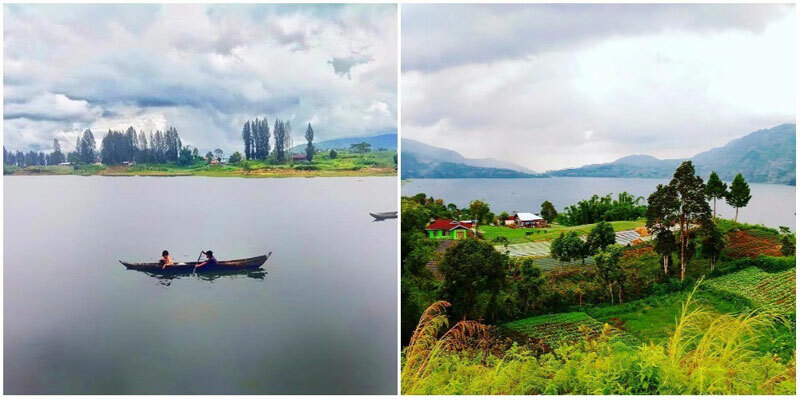 When anyone mentions Sumatra, the first place that often comes to mind is Lake Toba. But that’s not the only attraction in Sumatra. How about venturing westward? 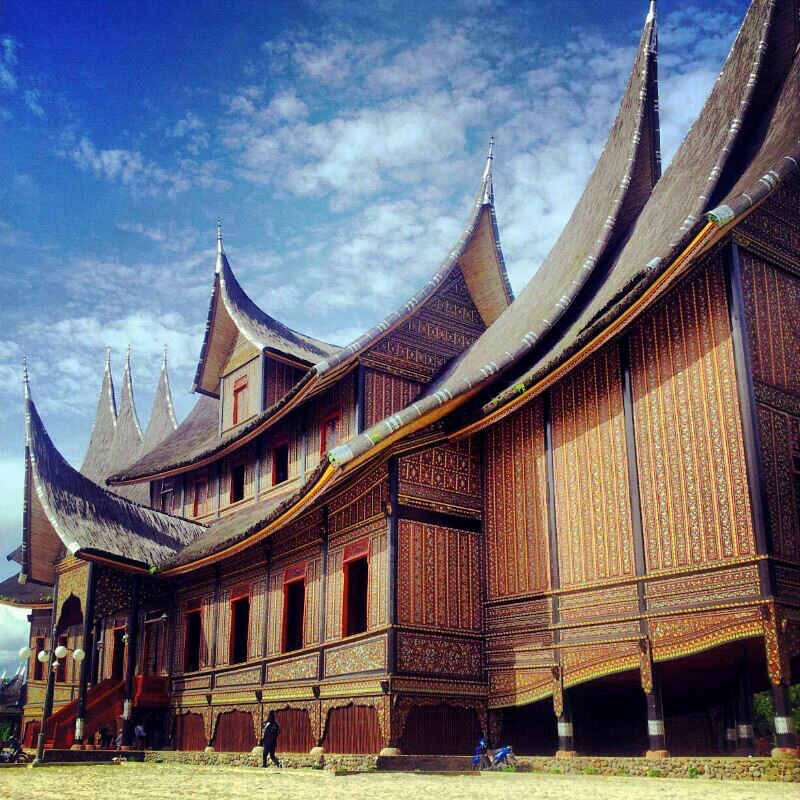 Did you know that West Sumatra is home to dozens of enchanting sites? 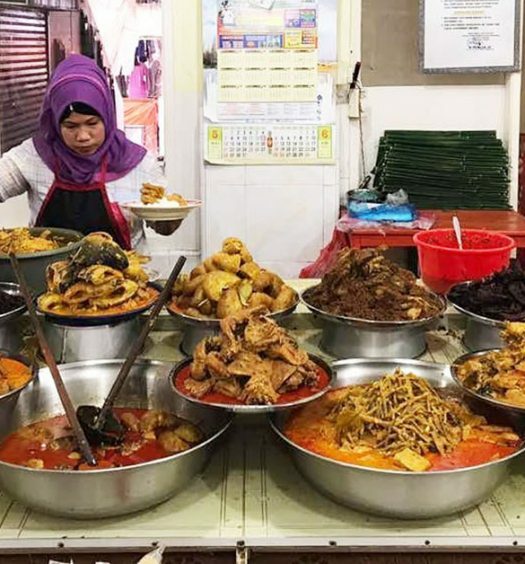 And there’s more than just rendang, the spicy meat dish native to this corner of the country. 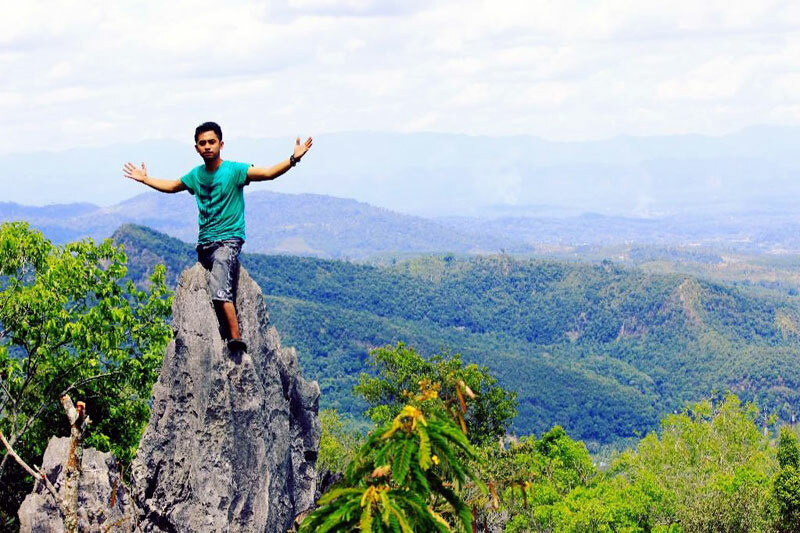 You will be amazed by the rich culture and beautiful natural attractions you can find here. Thankfully, you won’t have any trouble getting here! Many local airlines offer a direct flight to the region from Soekarno-Hatta Airport to Minangkabau International Airport located in the capital city of Padang, with flight rates ranging from USD $37 to $61, and it takes you less than two hours. 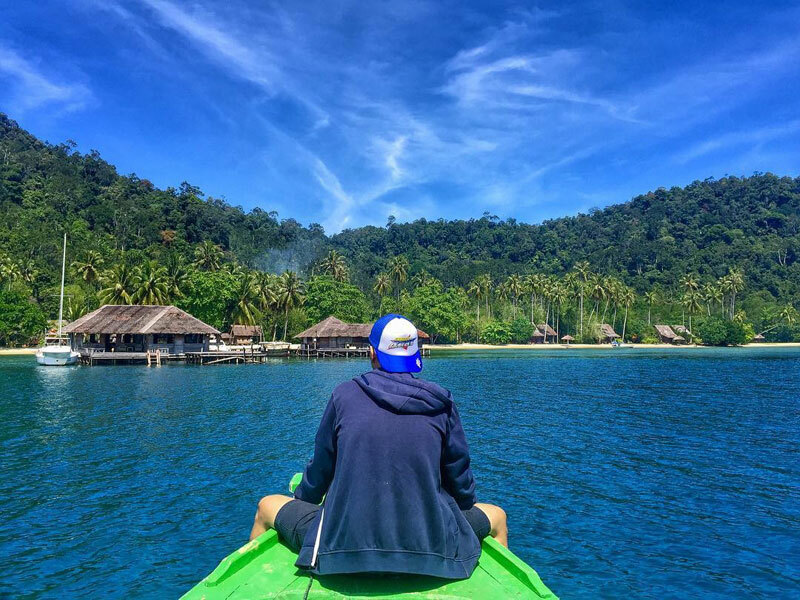 From land to sea, there are plenty of breathtaking sites to explore across West Sumatra, and the sights you’ll take in along the way will have you thrilled that you stuck around to see it all – and make the most out of your time in West Sumatra! Small, quaint villages aren’t only found in the Western world! 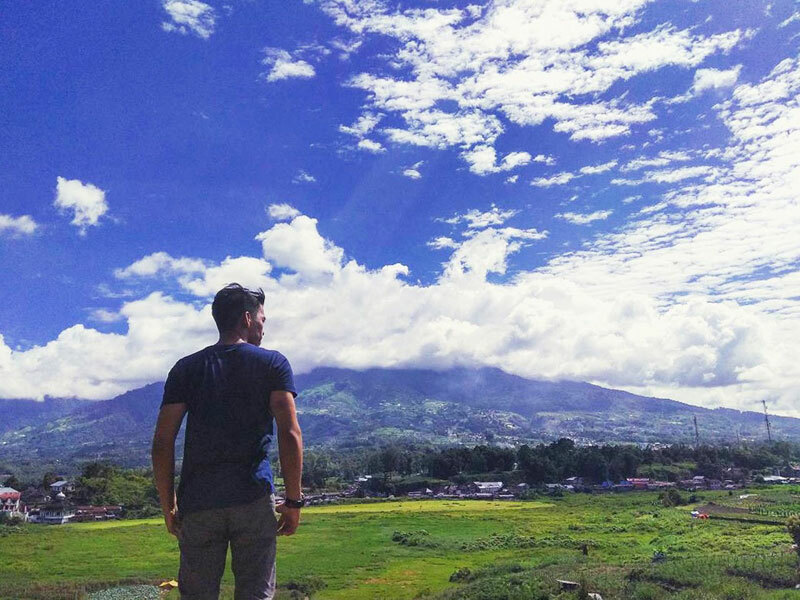 We promise you’ll love the rustic, tropical charm of West Sumatra’s small towns just as much as those in Europe. 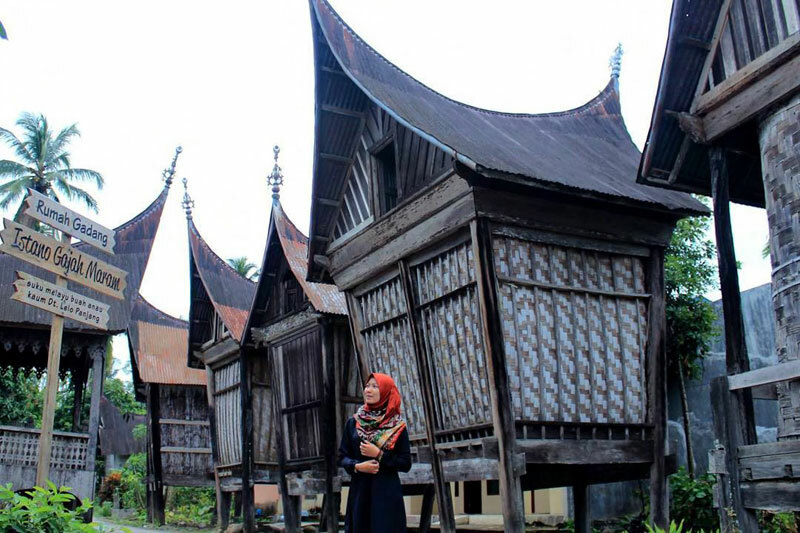 Take a trip to Solok Selatan regency and you’ll be rewarded with a delightful sight of preserved traditional houses called Rumah Gadang (famous for their pointy rooftops called gonjong, said to resemble a bull’s horn) of the indigenous Minangkabau tribe. The houses are pretty sparse in the regency but there is a more notable cluster in the Koto Baru Village. Since this complex boasts of 174 houses in total, you can get the full experience while you’re there, and tourism is highly encouraged – you are invited to stay in the houses, watch traditional dances, and learn the customs of the indigenous tribe! Getting There: It’s pretty easy to find the village. 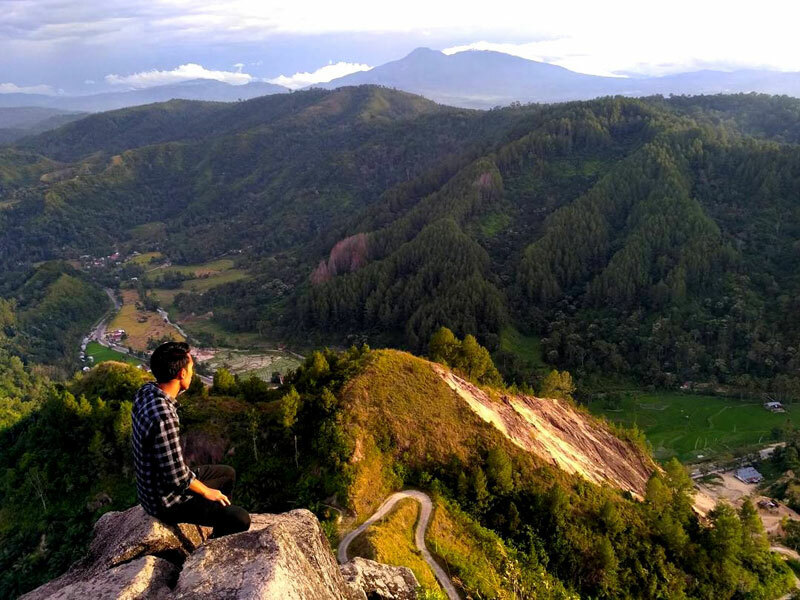 It’s around 150 km from Padang, or approximately a 3.5-hour drive and the village is located on the side of the main road called Jalan Utama Solok Selatan where you’ll find the big signs to the village. 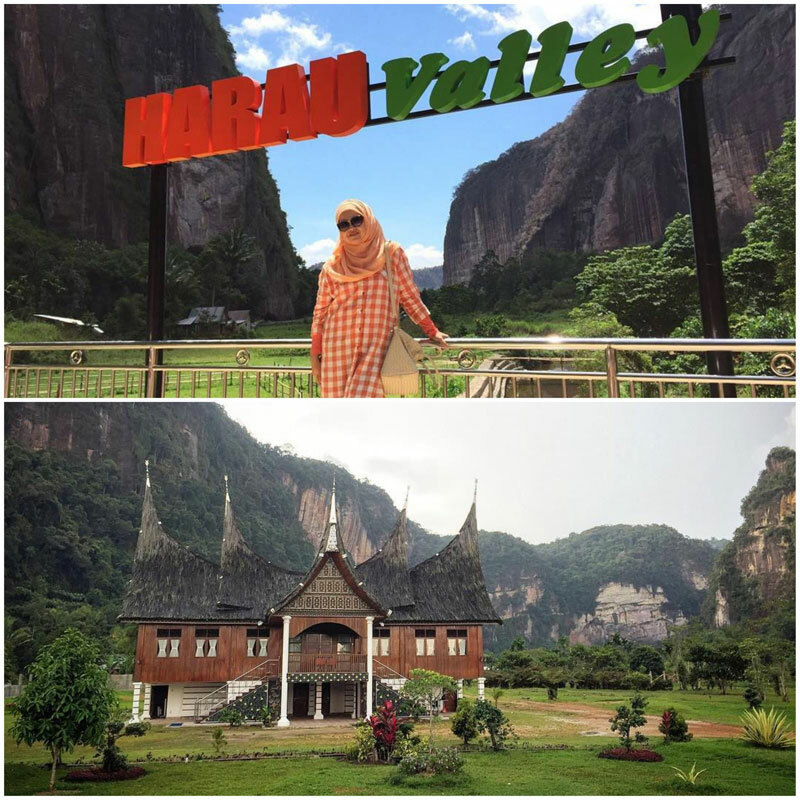 At Harau Valley, you can expect a land of natural beauty and hidden treasures. Magnificent waterfalls? Check. A sea of green rice paddy fields? Check. Beautiful pond? Check. Majestic mountains? Check! There’s something for every nature lover, no matter what you crave for. For avid rock climbers, the steep cliffs are a popular spot for a bit of a challenge. Some even claim that the colourful granite rocks here rival the ever-famous Yosemite Valley in the US! Address: Kota Payakumbuh, Kecamatan Harau, Kabupaten Limapuluh Kota. 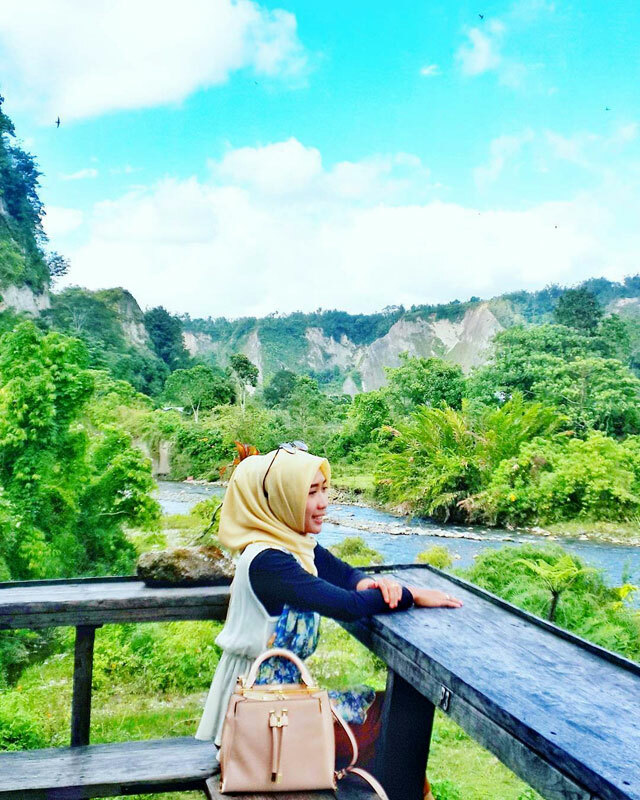 Getting There: From Payakumbuh (138 km from Padang) it’s approximately a 30-minute ride to the Lima Puluh Kota Region where the entrance to the valley is located. Find coordinates here. Entrance Fee: IDR 5000 (USD 0.37) for adults; IDR 3000 (USD 0.22) for children. 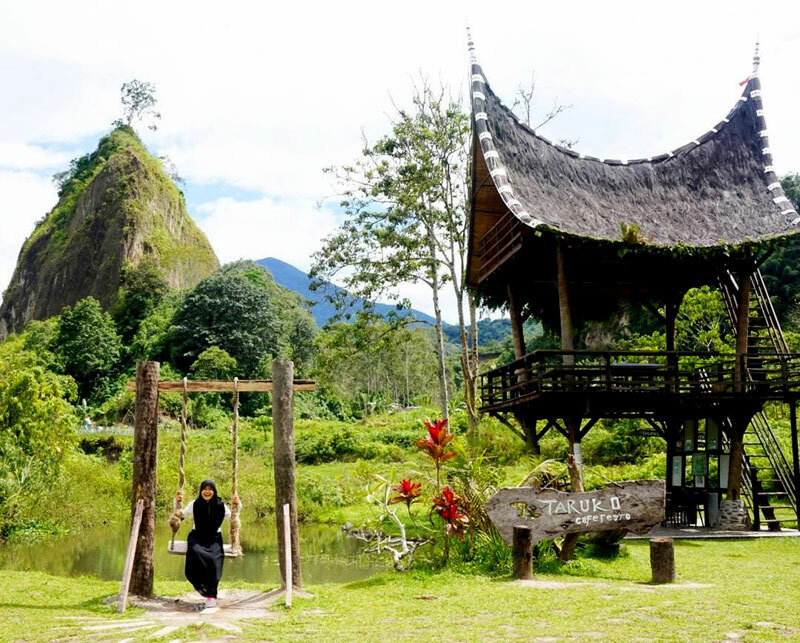 For a laid-back chill-out spot inside the city, head to Taruko Café and Resto, only a 20-minute drive from Bukittinggi that sits comfortably at the base of Ngarai Sianok Valley. Be prepared for a bit of a challenge as you descend the rocky terrain, but we promise it’s worth the trek! 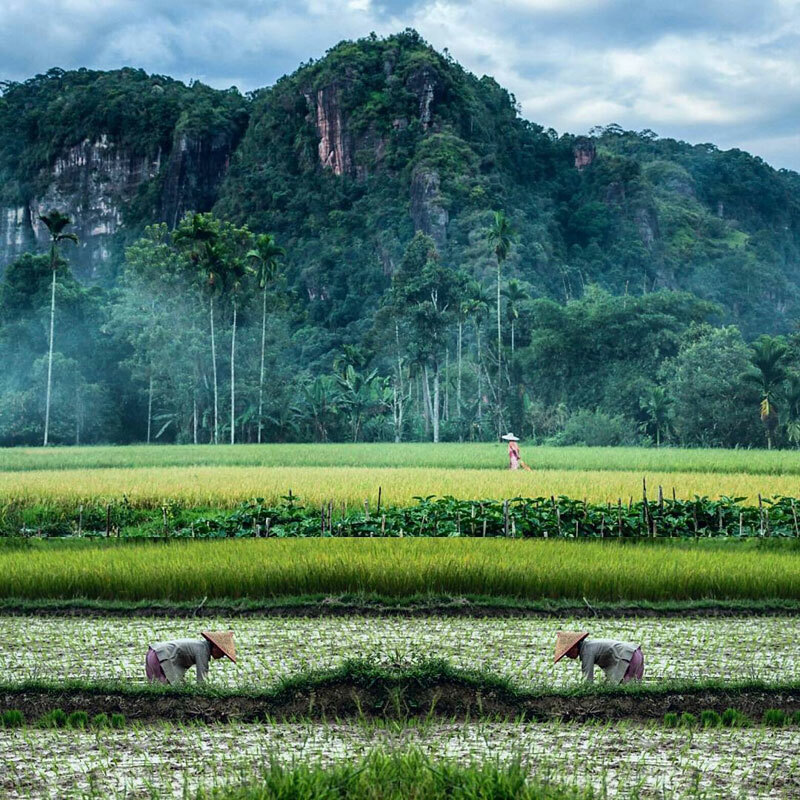 This great little spot has an awe-inspiring view of lush forest, hills, rice paddy, fields, and rivers. 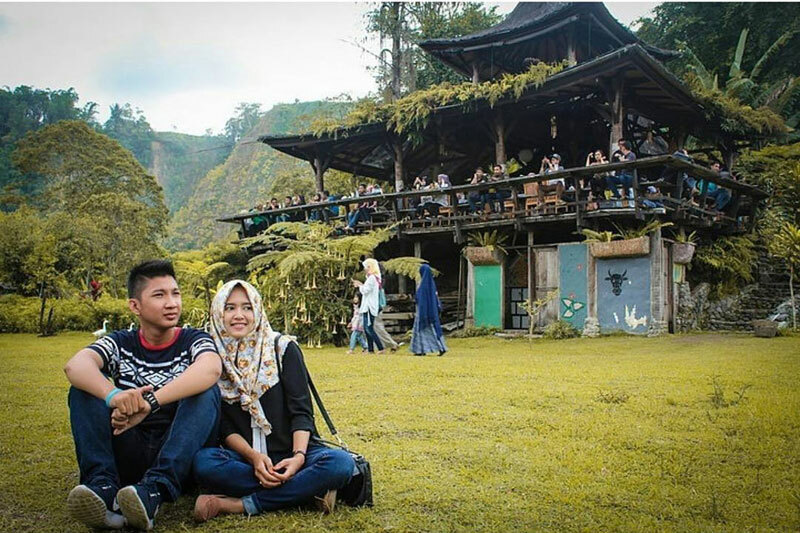 You will also be surrounded by architecture resembling the pointy-roofed Rumah Gadang, so you will feel immersed in the true Indonesian culture. 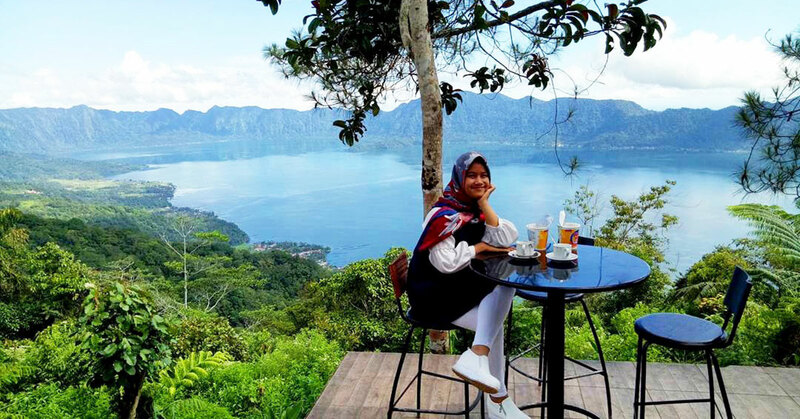 The café is built to resemble a treehouse from every kid’s wildest dreams, so you can eat and enjoy your West Sumatra dish (we recommend nasi dendeng batokok) or sip your coffee with your legs dangling. For those who would like some tunes while they eat a satisfying meal, groovy live music performances will help to create a soothing vibe. 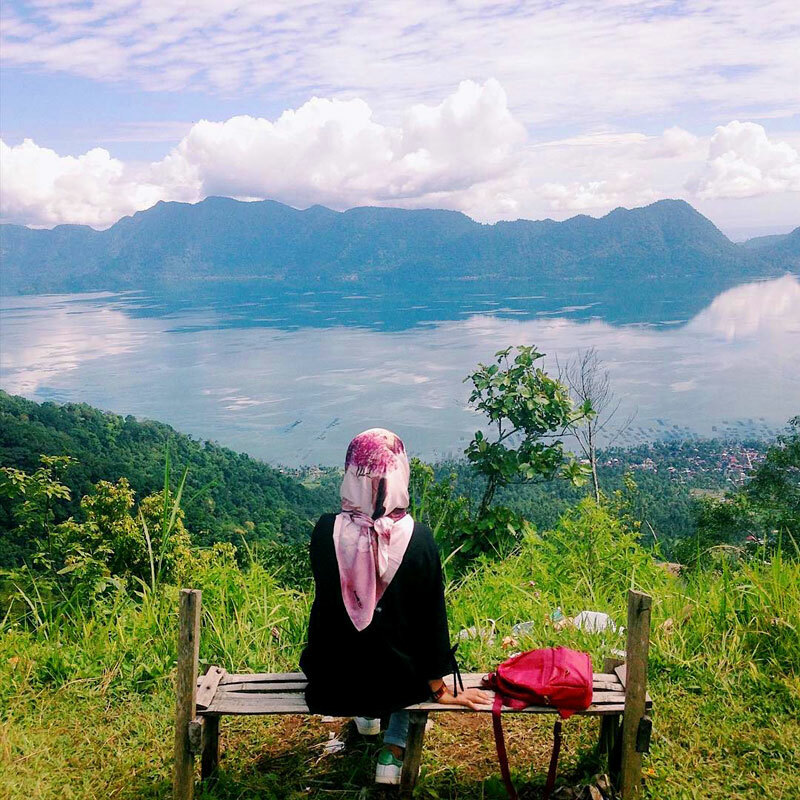 You can’t miss the turquoise-coloured Lake Maninjau, seen from Lawang Park. From the park, you can also see the mountains, sugar cane plantations, and there’s even a stunning spot where you can watch the sunset! You can pick strawberries, apples, and oranges straight from the garden if they are in season. Imagine licking the sweet juices of fresh fruit from your fingers and tasting pure, natural flavours as you watch the sun sink below the horizon. Simply paradise! 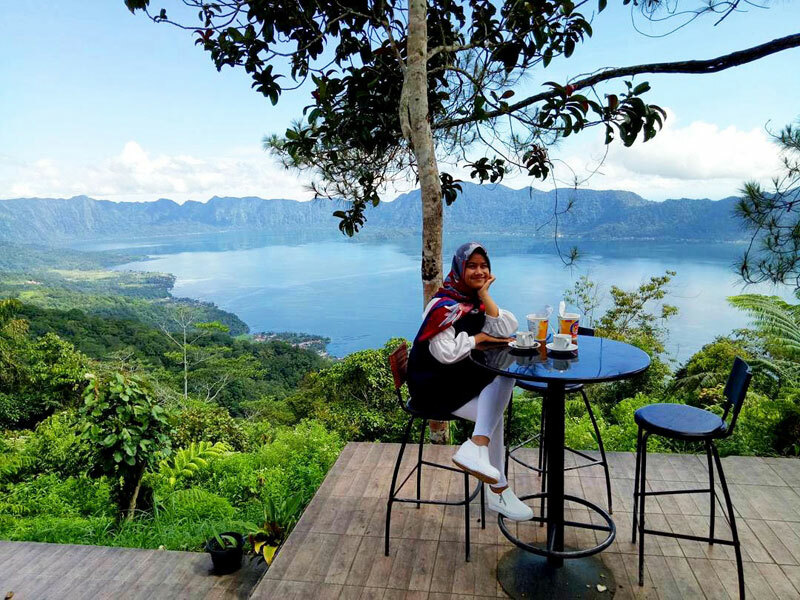 There are also restaurants and cottages at Lawang Park, with prices ranging from IDR 65,0000 (USD 45.50) to IDR 200,000 (USD 140). Getting there: Go to Bukittinggi and from there, it’s only a 45-minute ride (around 23km) if you take Jalan Ngarai down to Simpang Matur, which is near the park. Find coordinates here. Hours: Monday through Sunday, 7:00 am to 6:00 pm. Entrance Fee: IDR 10,000 (USD 0.70) person. There are also additional charges for parking, such as car (IDR 5000 or USD 0.37) and motorcycle (IDR 3000 or USD 0.21). 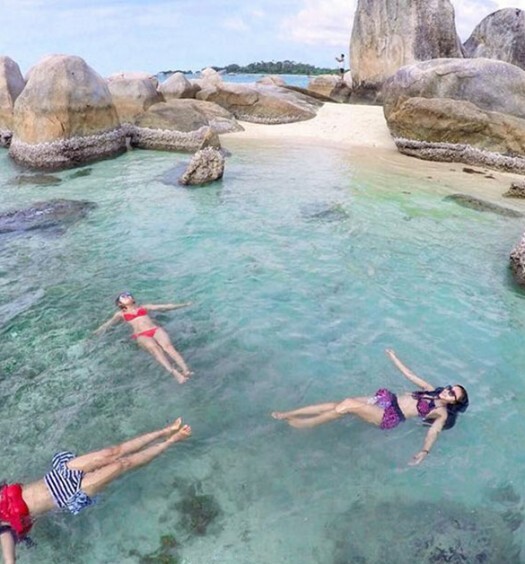 If you’re looking for something magical, you will want to make the trip to Lubuk Bulan. 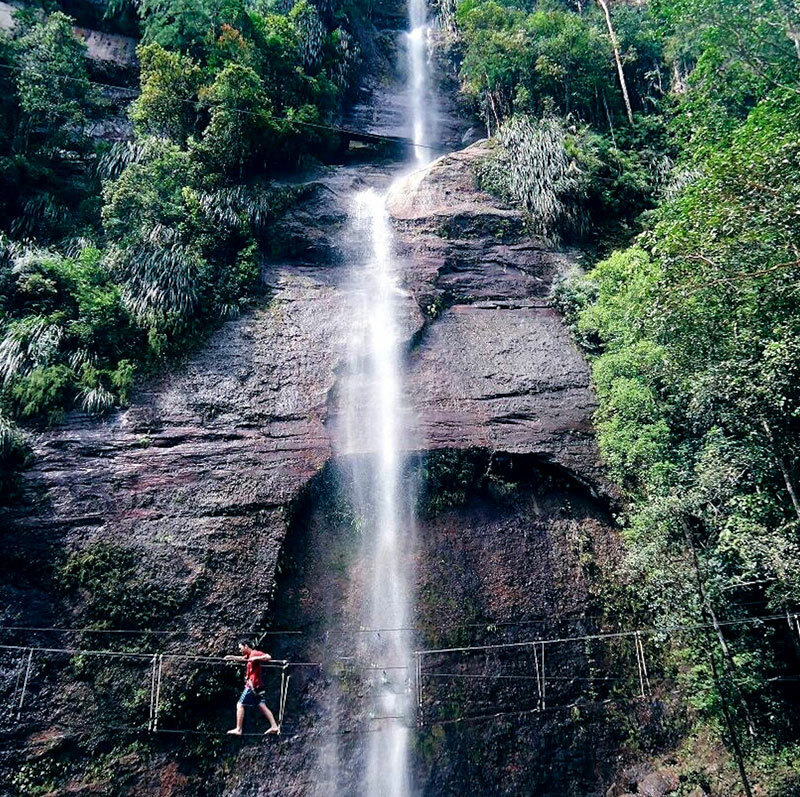 The waterfall’s stream falls from 50 metres high into a crescent-shaped pool below. 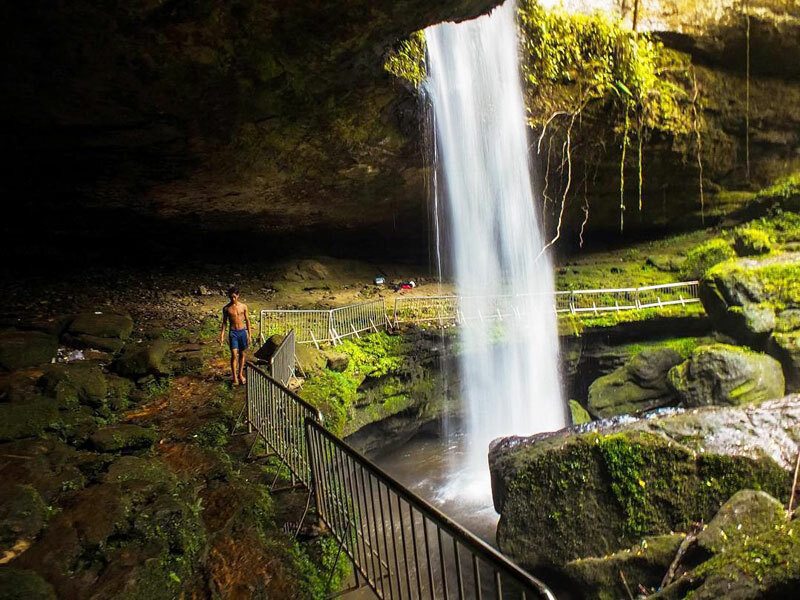 You’ll be enchanted when you realize that there’s a hidden cave underneath the pool! The water, after rushing down from the waterfall, flows through a 1 km-long passageway and comes out to water the nearby rice paddy fields. It makes sense that the locals called it “Air Hilang” (or Missing Water)! This is a beautiful spot to sit and relax as you listen to the soothing, relaxing sounds of the rushing water – or to pose for a few selfies, whether you’re alone or with friends! 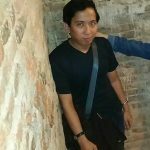 Address: Koto Alam, Kanagarian Simpang Kapuak, Kabupaten Lima Puluh Kota. 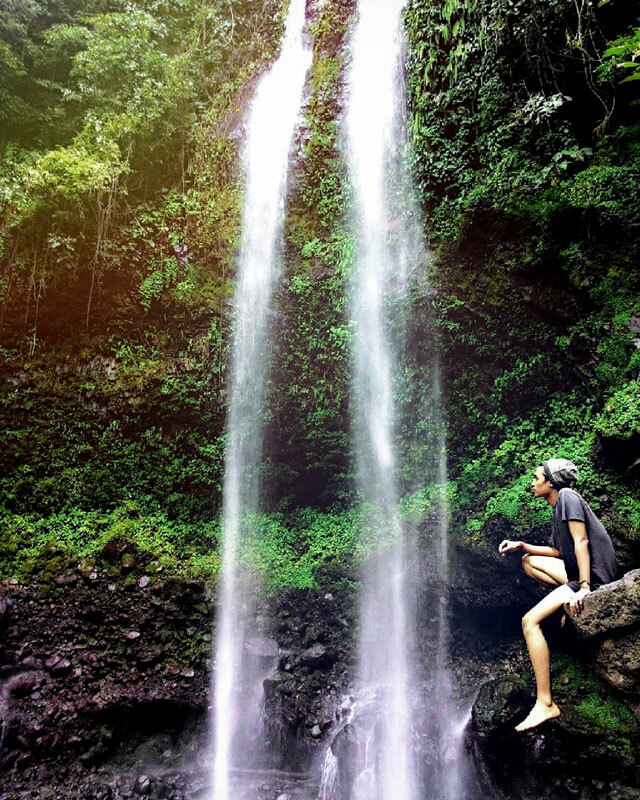 Getting there: The waterfall is an 4 – 5 hour drive from the town of Payakumbuh. From there it’s another 1.5 hours trip to Simpang Kapuak (or Kapuak Intersection) and it’s going to be a steep journey so it’s advisable that you drive there with an off-road motorcycle. This hill is a hikers’ delight (and will please any photographer!) 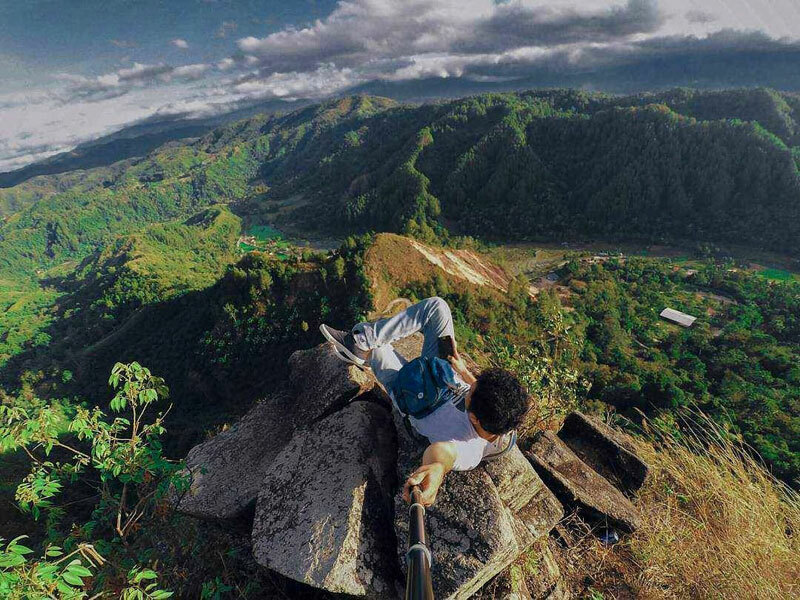 with an amazing view from the top. 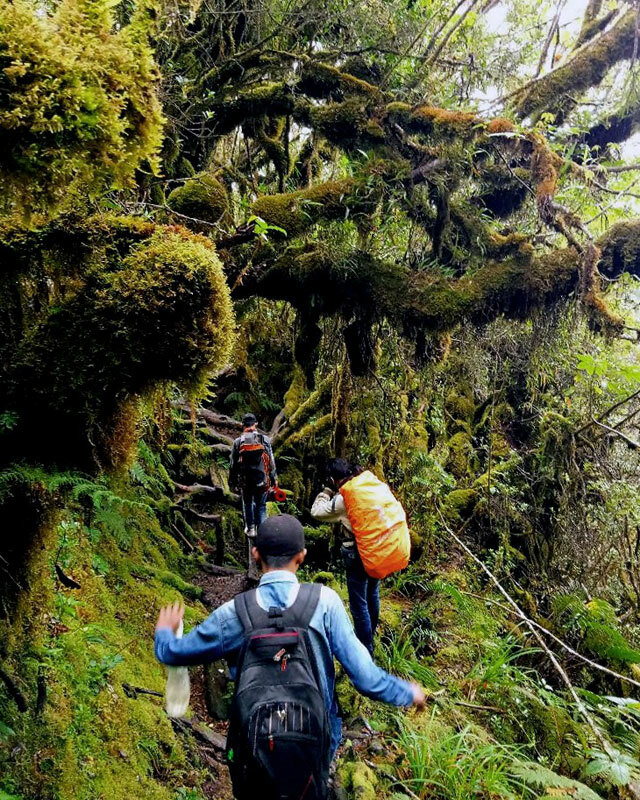 The path to the summit was trail blazed by the residents of Koto Sungai Lasi. 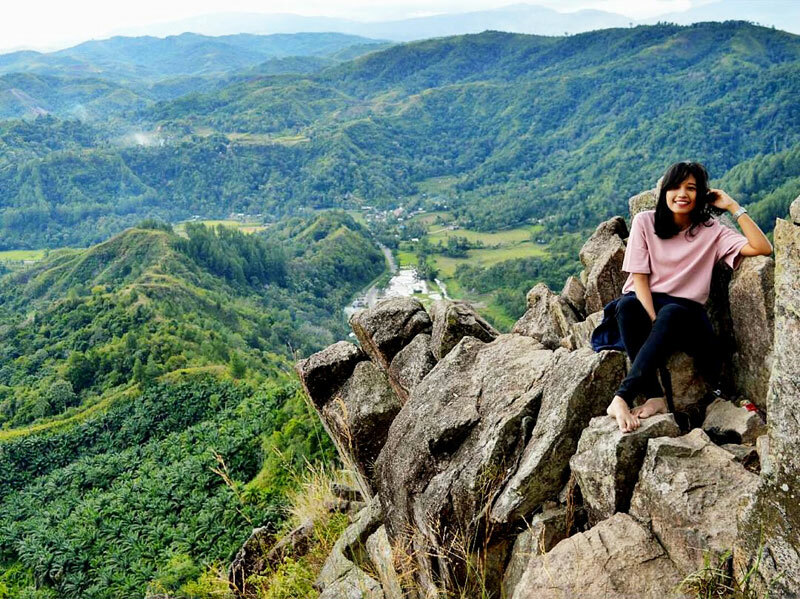 You can reach the top quickly (around 15 to 20 minutes to the summit) where you’ll get the best view around of the miles of lush, endless greenery below you. You’re on the top of the world! Getting there: From Solok it’s a 15 minutes-drive en route to Sawahlunto. Take the first right turn after finding the elementary school SDN 05 Guguak Sarai take a right turn where you have to trek through small, steep road. Find coordinates here. Entrance Fee: For parking only, IDR 3000 (USD 0.22) for motorcycle, IDR 5000 (USD 0.37) for car. 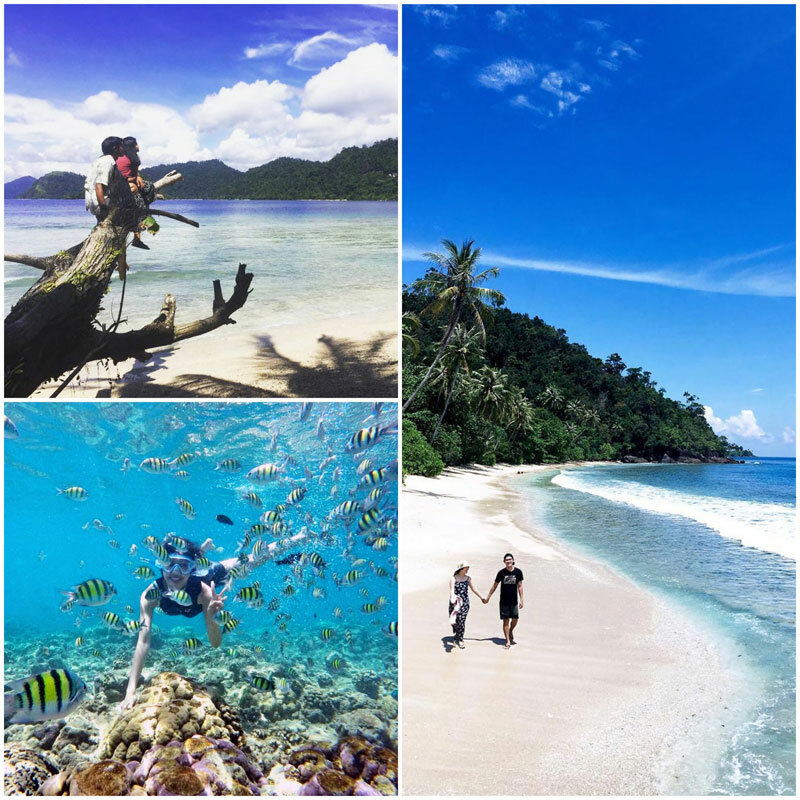 Pristine white beaches are abundant in Indonesia, and West Sumatra is no exception! 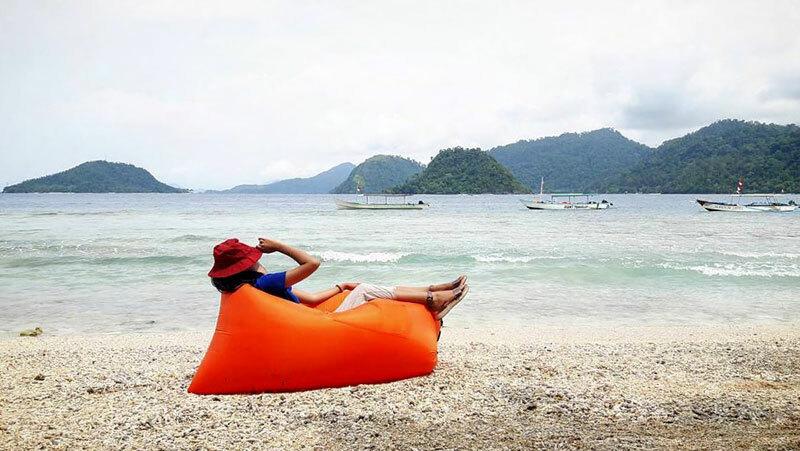 Just catch a boat to Pagang Island and—voila!—white sand beaches and crystal water await you (perfect for beach bums!). The water is so blue and clear that we’re sure you’ll want to jump right from the boat even before you set foot on the island. 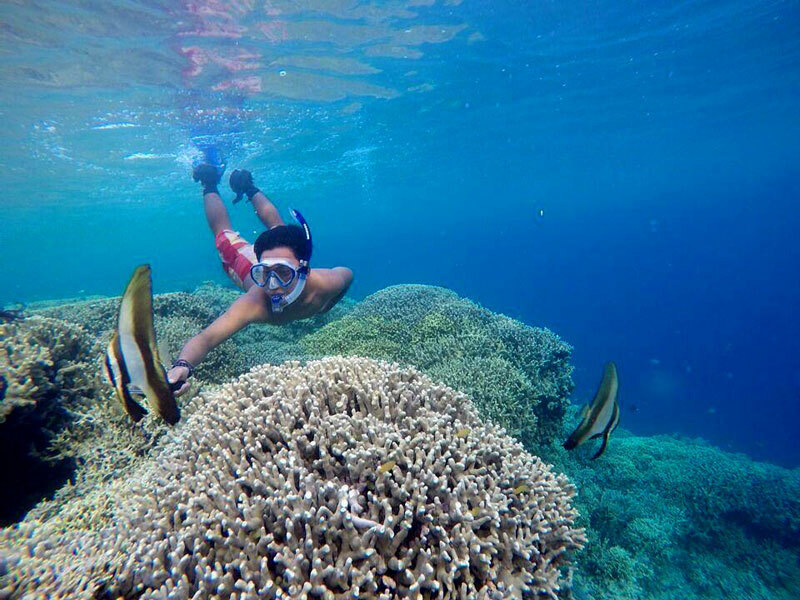 The underwater landscape is teeming with delightful little colourful fishes, making this a top destination for snorkeling fans! This is also a great location for those who like to travel a little more independently – since the island is largely untouched by tourism, this is a great spot to pitch a tent and stay a night or two (just be sure to bring supplies – and food!). Getting there: From Padang go to Pelabuhan Bungus (10km) where you have to visit several boat rentals and check for a price that’s right for you (it usually starts from IDR 250,000 or USD 17.50 /person). Afterwards it’ll be a 50-minute ride by speedboat. Tea lovers unite – we’ve found a perfect spot for you. 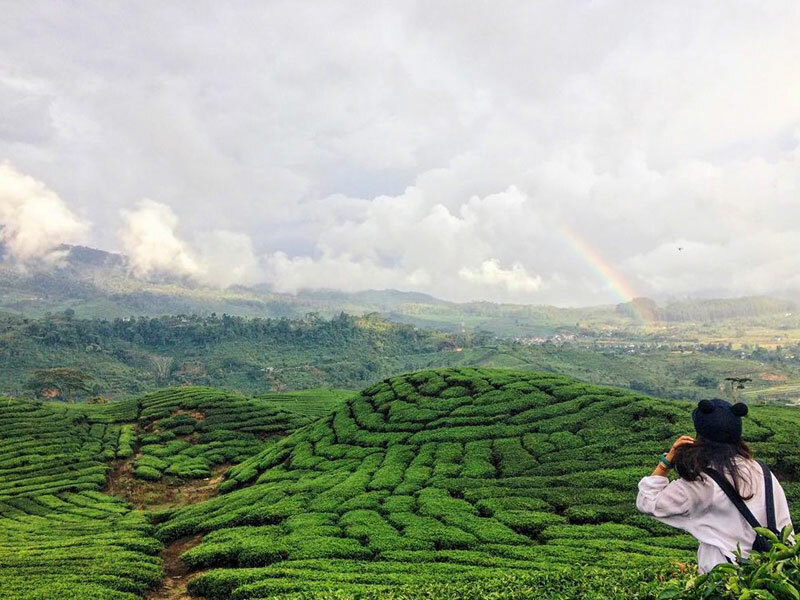 Located at 1400 to 1600 metres above sea level, the tea plantation of Alahan Panjang (in Gunung Talang Solok) will provide a relaxing and cool respite from both heat and crowds. We love the verdant landscape with that wonderful tea smell wafting in the air, and we’re sure you will too! 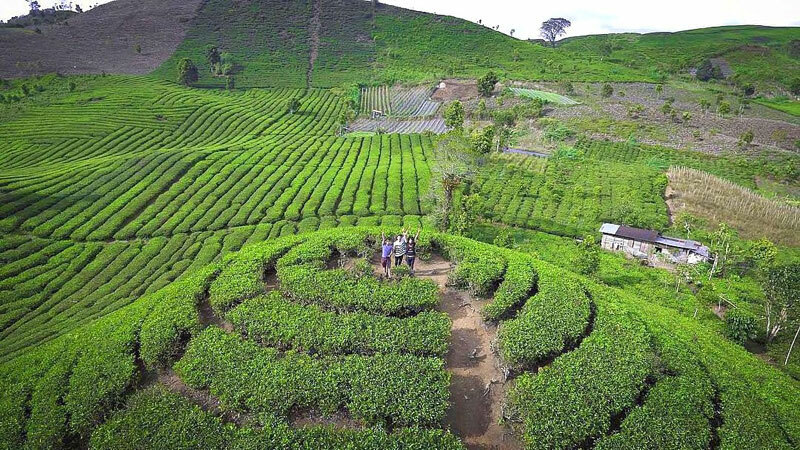 From here, you can watch expert tea farmers pick only the best tea leaves. 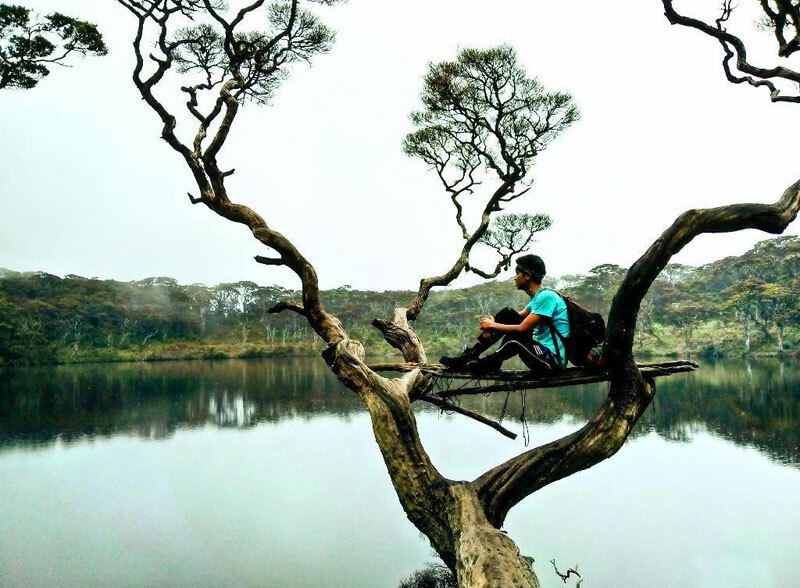 A regional bonus in visiting this sweeping tea garden is that it’s not far from not one, but two gorgeous lakes: the Danau Kembar (Twin Lakes). Like the tea plantation, these lakes are located on high land, making this a perfect spot for you to work a little camera magic! 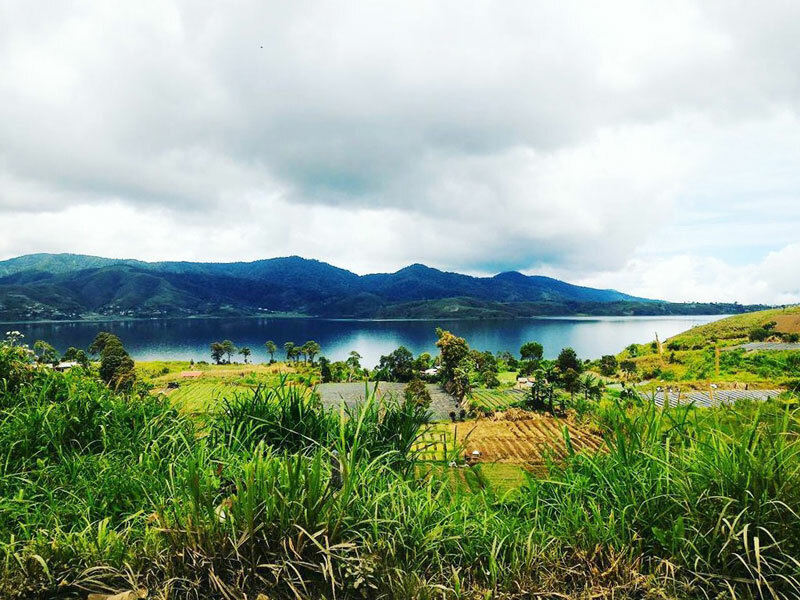 Getting there: It’s 65 km from Padang to Solok and located at Kecamatan Lembah Gumanti. The roads are quite winding and you’ll pass active chalk mines and cement factory. Due to the factory, be cautious of huge trucks on the road. Find coordinates here. 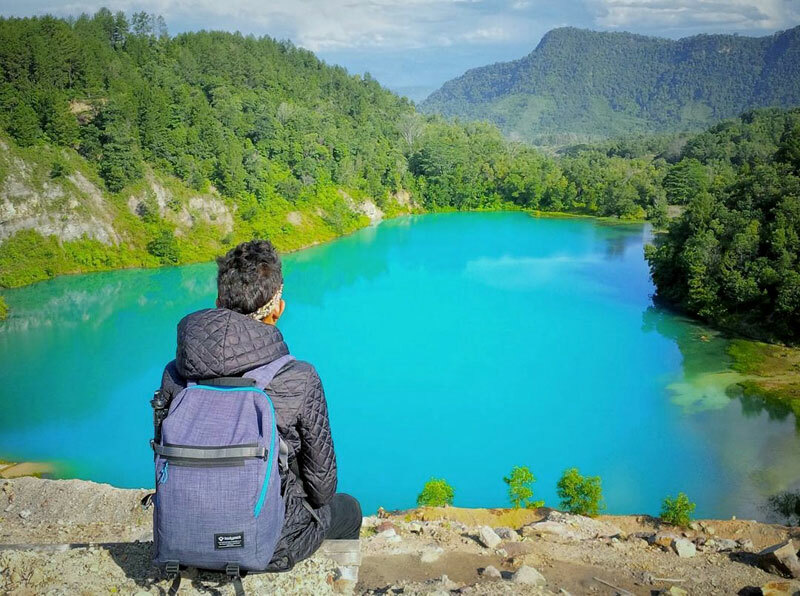 This lake, called Danau Laut Tinggal and nicknamed the Virgin Lake, is a scintillating, azure-coloured dream at the summit of Mount Malintang. It’s surrounded by rich, emerald-green landscapes that will provide a heavenly shelter from busy city life. 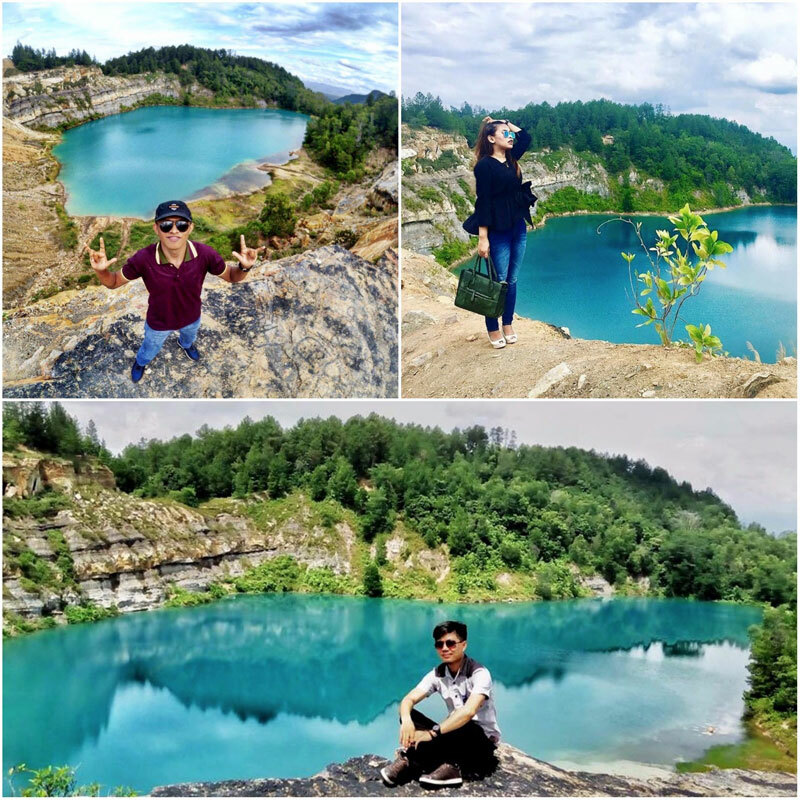 While the lake itself (around 2 km in diameter) isn’t swimmable due to its high sulphur content, don’t worry too much – the view will surely be enough to quench your thirst for natural beauty! Getting there: It’s going to be quite a trek. It’s a 4-hour drive from Padang to Kota Simpang Empat, the capital of Kabupaten Pasaman Barat. From there it’ll be around 10-hour trip to an old village called Desa Simpang Lolo Sosopan where you can ask for a guide to take you up to the lake. Find coordinates here. 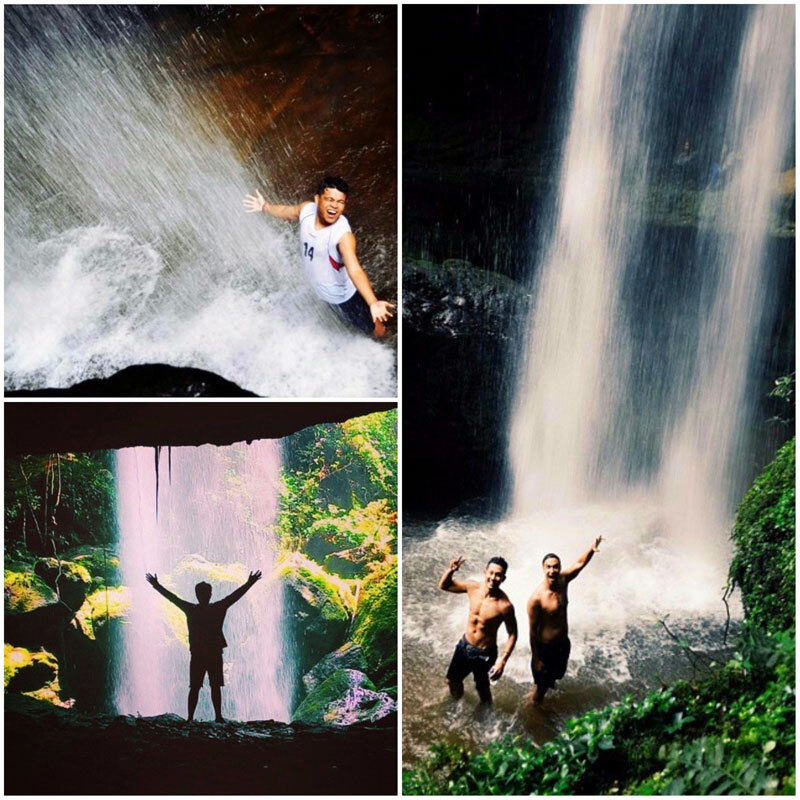 These magnificent waterfalls rush down a cliff wall nearly 50 metres in height, brushing its surfaces and making the surrounding cream glitter and glisten with a refreshing spray of water. The higher the wall, the greater the waterfall is, which means this is a great spot for a zoom lens on your camera! We know you’ll love the lush vines and creepers that wind and weave throughout the wall, giving the rock face a magical feel not unlike that of an enchanted fairytale forest! According to local myth, the name is derived from a queen who ruled the region (FYI: gadih means “girl” in Indonesia!) and the pond located high above the cliff was used as her bath. Care for a dip? Address: Nagari Tanjung Sani, Kecamatan Tanjung Raya, Kabupaten Agam. 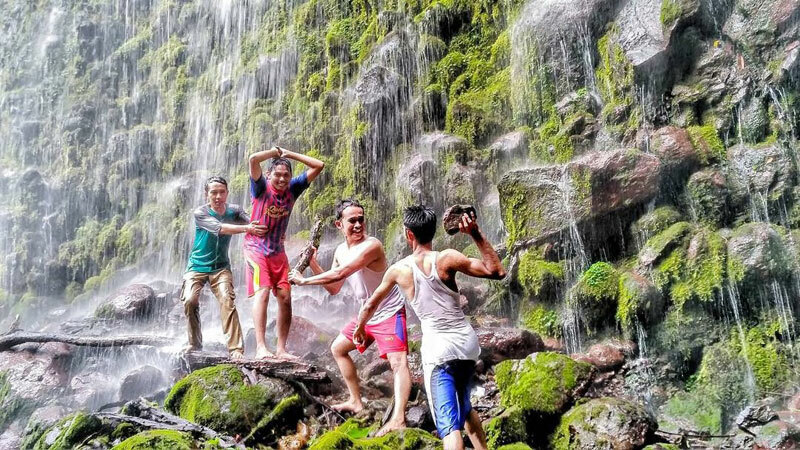 Getting there: the waterfalls are located at the border of Jorong Dama Gudang and Jorong Arikia, not far from Maninjau Lake. If you’re a fan of Lord of the Rings, don’t miss this stunning location. Escape into the Third Age of Middle Earth in this wild, brambly forest that strongly resembles Fangorn Forest! 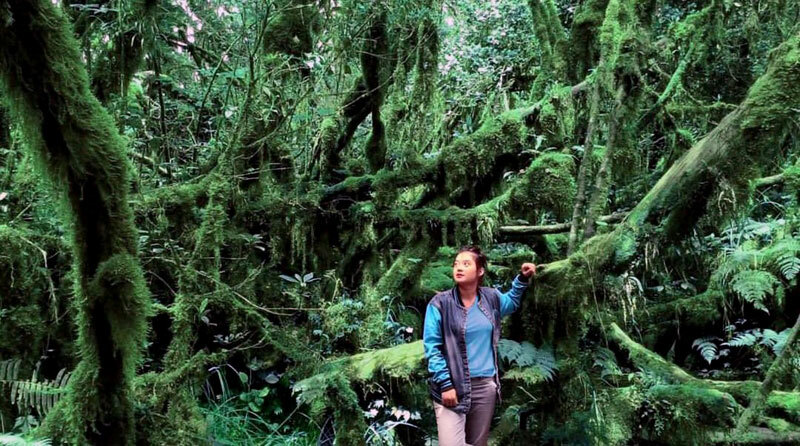 Mount Singgalang is a forest lover’s dream; a cool, moss-covered, soft-to-the-touch, highly Instagrammable sea of trees. If it wasn’t freezing cold (Singgalang is 2,877 metres above sea level) we’d be tempted to pitch a tent and stay the night – so be sure to layer up if you decide to visit! 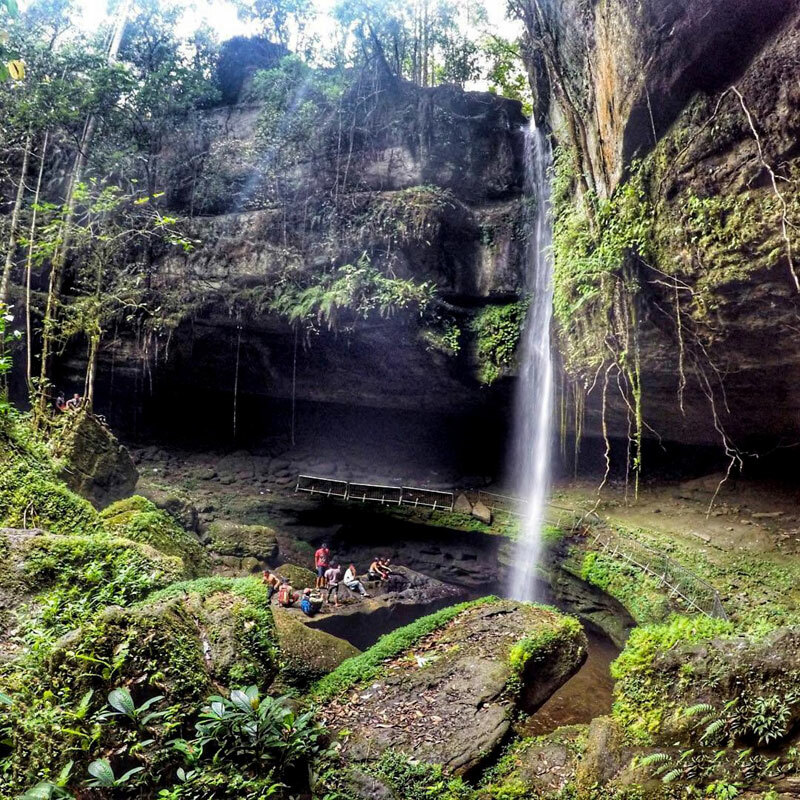 If you’re a botany enthusiast, or just like plants, then you’ll be pleased to know that this magical forest is filled with exotic plant species and also boasts some seriously cool waterfalls and lakes. Feel free to Instagram on-site; thanks to the nearby cell phone tower, you’ll have a great mobile signal! 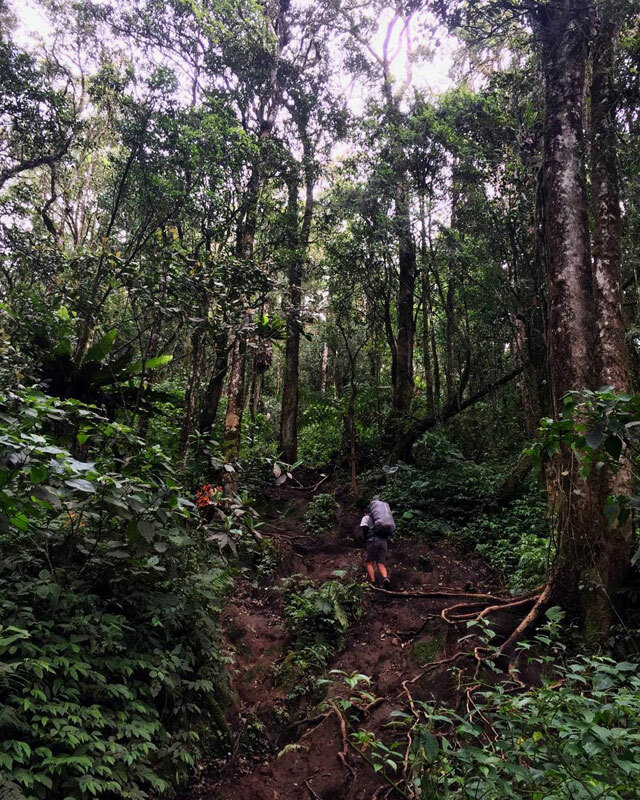 Getting there: Though there are three routes to reach Mount Singgalang (Toboh, Balingka, Pandai Sikek), better take the Pandai Sikek route because it’s closer to Padang where it’ll only take you around 6 hours to reach the forest. Find coordinates here. We’ve yet to discover who first coined the nickname “Microwave Hill”, but once you get here you’ll probably be more focused on the astounding view than the silly name! 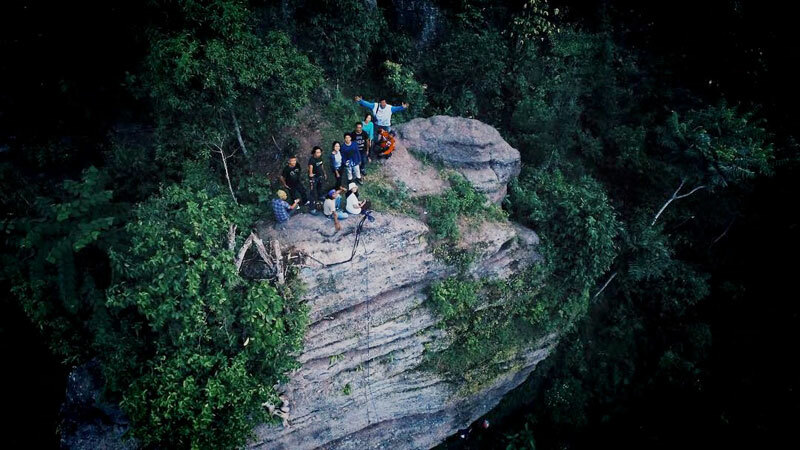 The rocky limestone hill—like Guguak Sarai—provides plenty of prime spots for pictures, and if we were to guess the origin of the name, we’d assume it has something to do with how the rocks can be quite hot to the touch on a sunny day (so better plan your trip here in the morning or evening)! Getting there: From Sawahlunto go to Silungkang district where the site is not far from Puskesmas Intersection (Simpang Puskesmas). Find coordinates to Silungkang here. 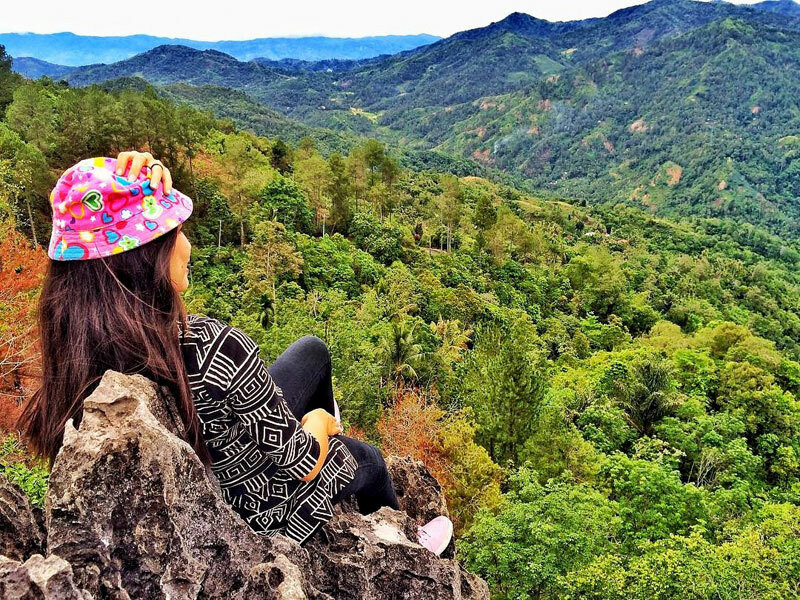 For those looking for a feast for the eyes, you’ll definitely want to stop here – especially if you like hiking! 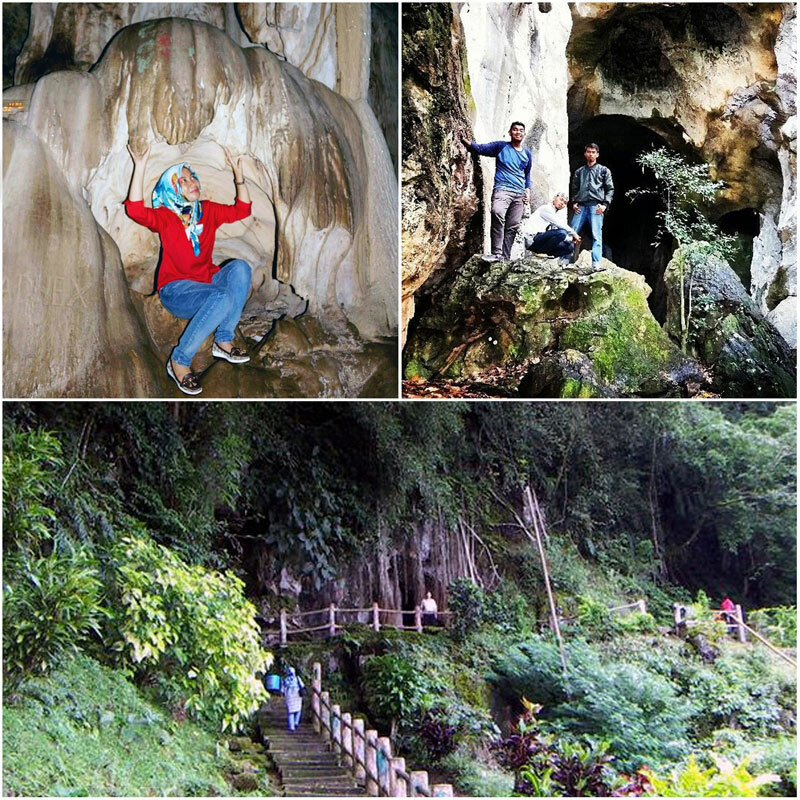 Trek 13 km from the Sawahlunto city centre, down a dirt road, and you’ll discover this beauty, a little hidden gem tucked away in secret. 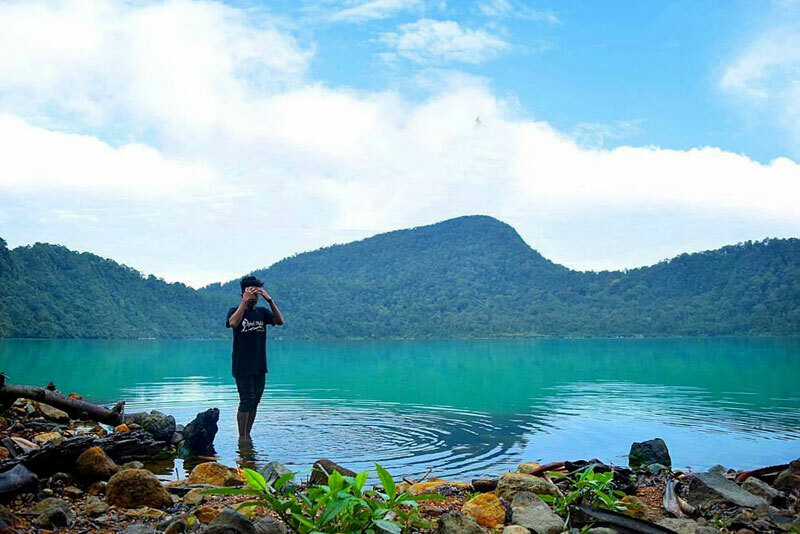 Danau Biru Talawi is actually a man-made lake, gradually formed through years of excavation from mining activities in the nearby coal mine (which is still active even today!). Just find a spot and enjoy this magnificent dream shot in heavenly blue – a magnificent place to relax surrounded by nature. The nearby trees and shade also make this a great stop for a picnic lunch! 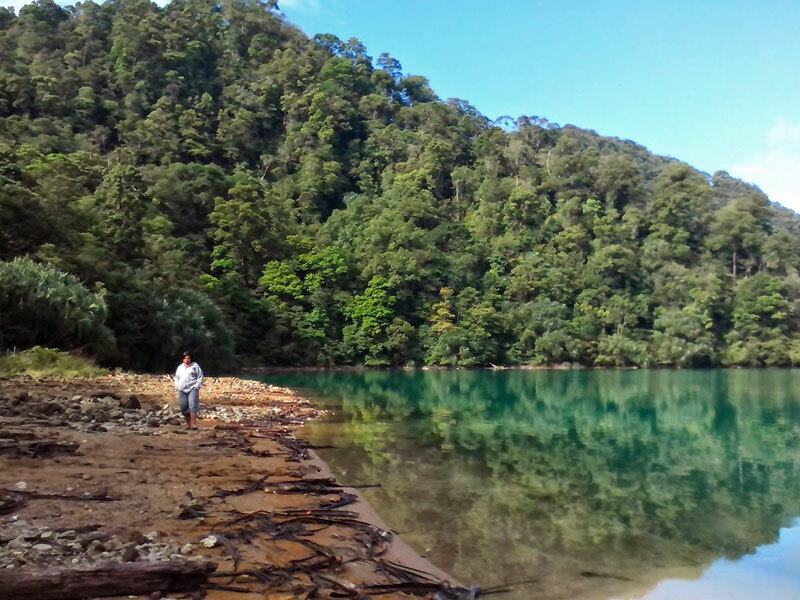 Getting there: The lake is located 13km northeast of Sawahlunto, or around 30 minutes on your way to Kandi Zoo area. Find coordinates here. Entrance Fee: for parking only, IDR 5000 (USD 0.37) for motorbike and IDR 10,000 (USD 0.75) for car. If you possess the true spirit of a traveller, we bet you love meeting new people and experiencing different cultures. And there’s no better way to get to know other people’s customs than spending time with them yourself! 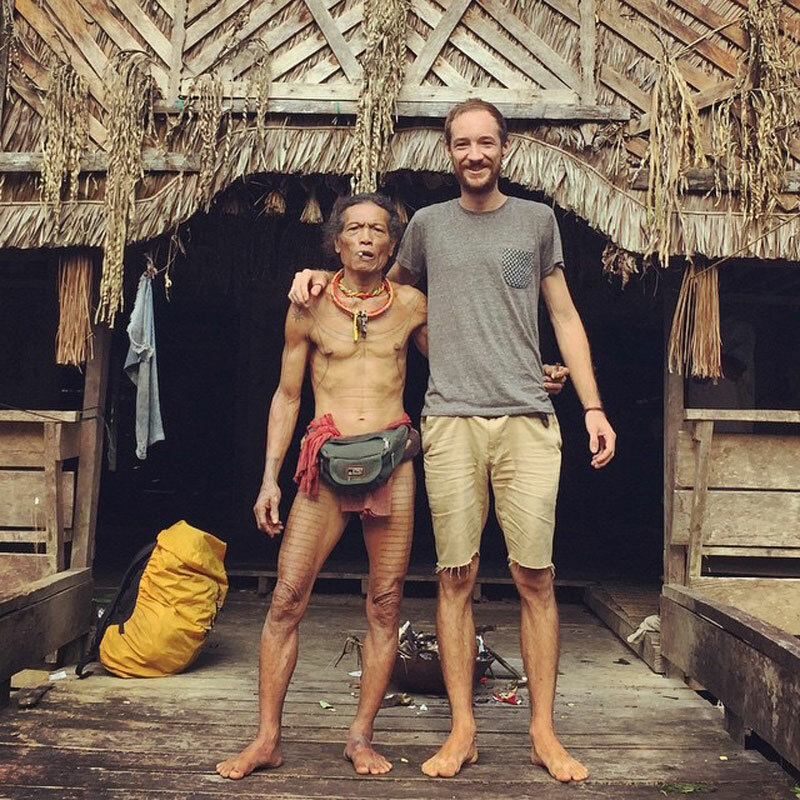 The Mentawai tribe has one of the most unique cultures, and some of these customs are still preserved today – namely, their tattoo making! Their particular practice is among the oldest body art methods around today, using natural ink, and with every motif having different significance. Some advertise rank and profession; for instance, if you were a hunter, your tattoo motif would be an animal-based art. 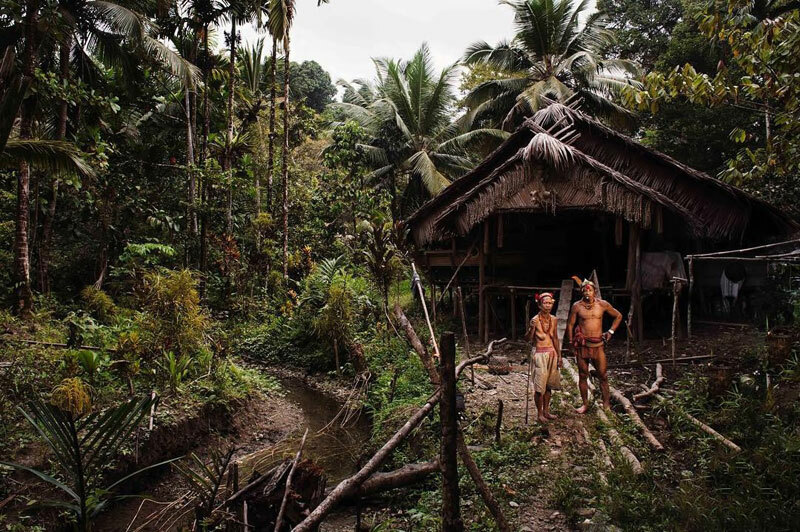 Though you might find their customs outdated or strange (such as hunting rituals, poison-tipped hunting arrows, animistic beliefs), the experience itself is priceless, and will give you insight into a rich culture that can only be found here. 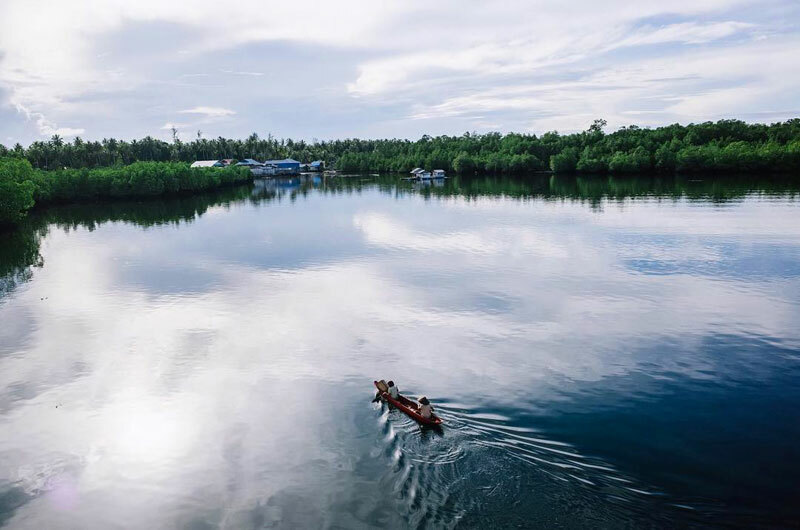 Getting there: the Mentawai islands is located off the west coast of West Sumatra, and it comprises of four main islands – Siberut, Pagai Utara, Pagai Selatan, and Sipora. 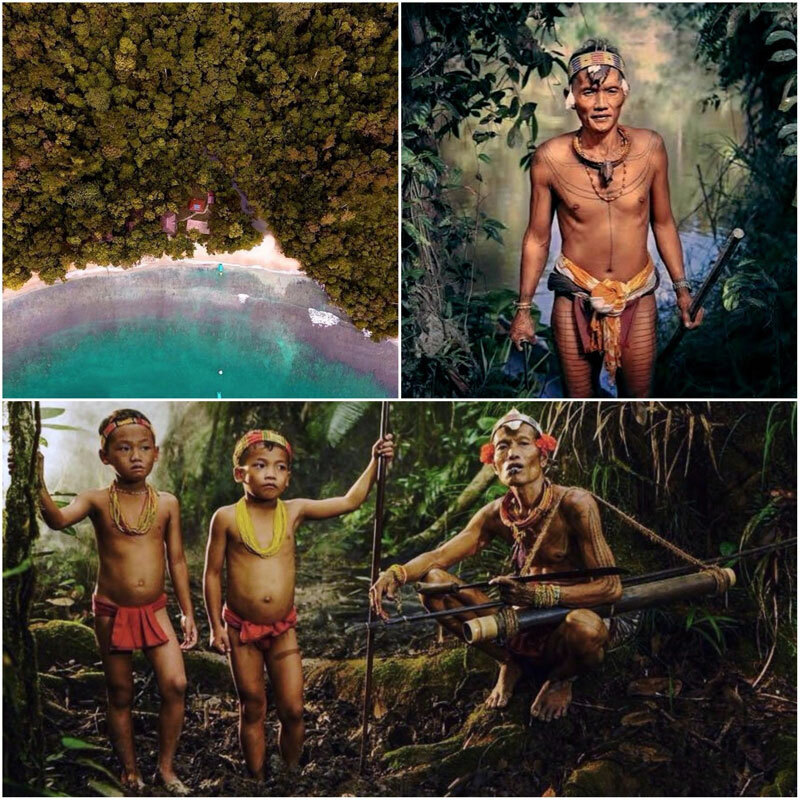 Siberut Island is the one you should visit. 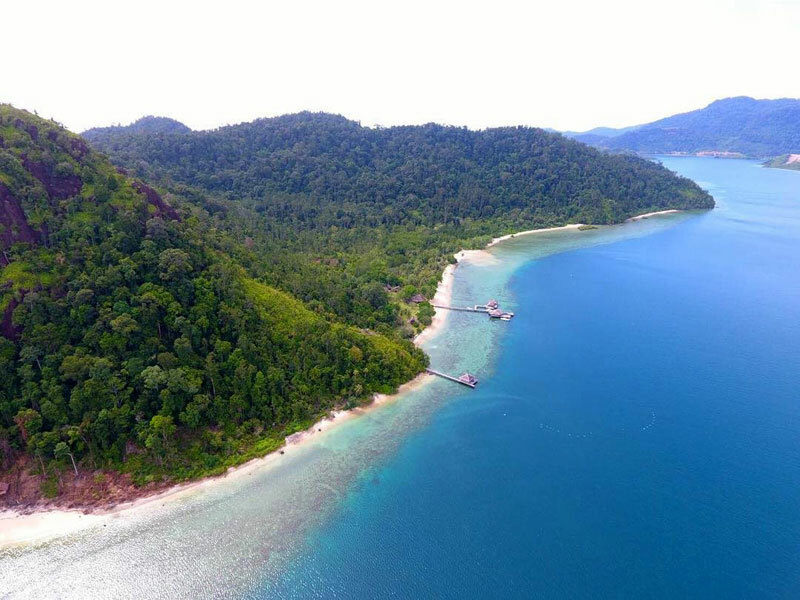 It’s a 10-hour trip from Bungus Port in Padang to Muara Siberut with boat fares ranging from IDR 105,000 (USD 7.86) for Economy Class to IDR 400,000 (USD 29.95) for Executive Class. We suggest you use the service of a guide which will be available at the port. 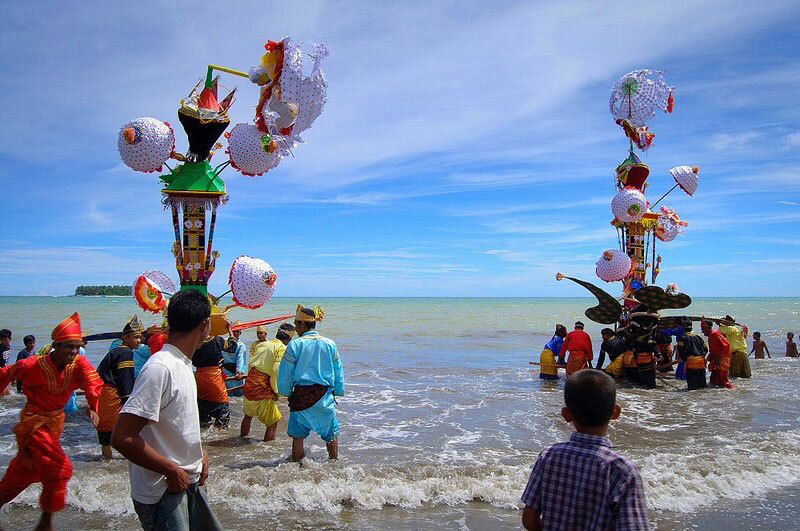 You might be familiar with the island of Madura and their famous bull races (karapan sapi), but good news – this incredible sight isn’t limited to Madura! You can also find it in West Sumatra, called Pacu Jawi. If you’ve never heard of this before, it’s actually not a race! Instead, it’s a sort of a game or celebration held for the young bulls after harvest (no animal cruelty here). If you don’t mind getting your hands dirty (or your legs), this is an activity worth checking out. But be warned that it happens on muddy ground, so prepared to get splashed! If you’re looking for a rush, nothing will get your energy up faster than these races. While most games would be a contest to see who can win something first, the point of this particular game is not who reaches the finish line first but who can keep the bulls running in a straight line – which is a lot harder than it sounds! It is said that this “straight line” is also a local philosophy, to encourage the community to live with integrity in their everyday lives. 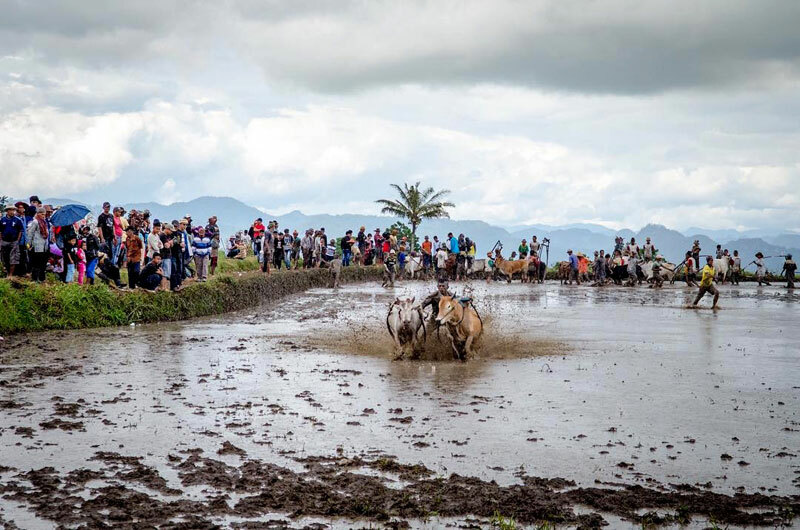 Getting there: The races are held for four weeks in four kecamatan (region) in Tanah Datar: Pariangan, Rambatan, Lima Kaum, and Sungai Tanah. Tanah Datar is located around 97km from Padang and to get there just take the Jalan Padang – Solok highway. Find coordinates here. 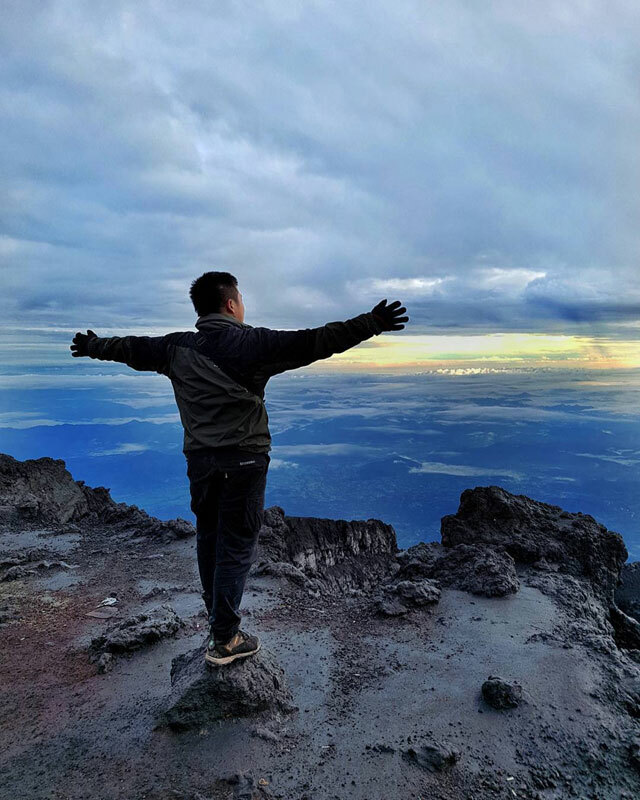 At 3,805 feet above sea level, Mount Kerinci is an imposing figure for any avid hiker, therefore a must-visit location – especially if you’re seeking a challenge! 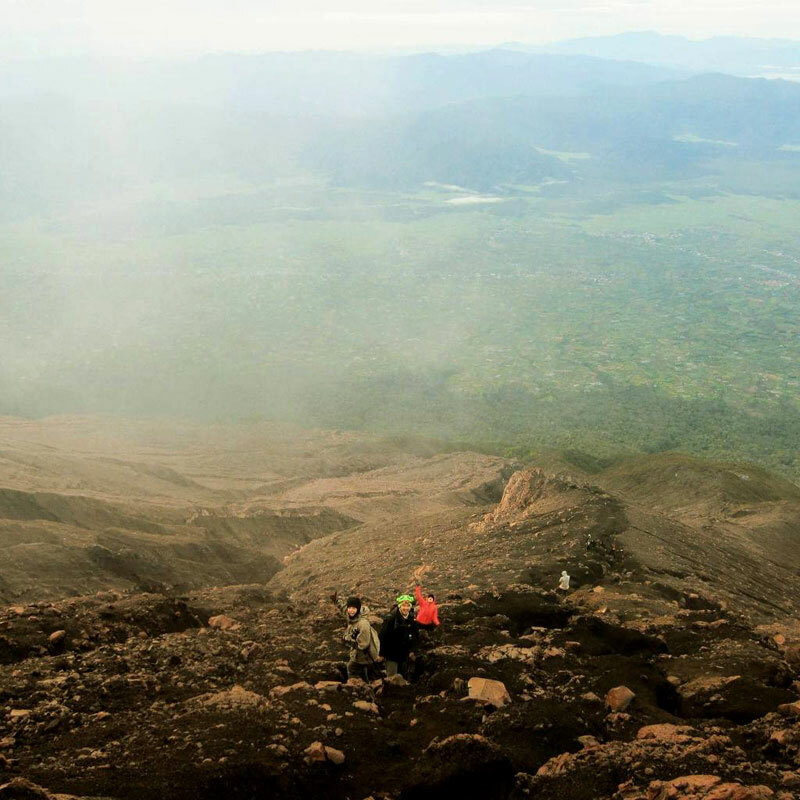 Mount Kerinci is in fact the highest volcano in Indonesia, and makes up a part of the conservation area Taman Nasional Kerinci Seblat, located along the border between Padang and Jambi to the south. 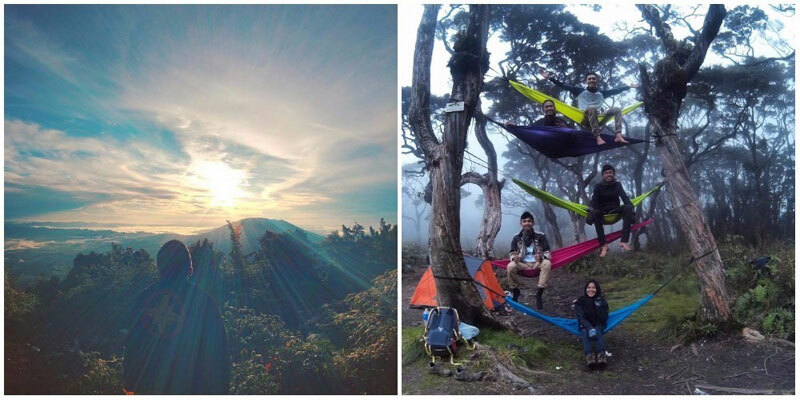 The summit is a bit of a trek, so be ready for a 9 to 11-hour hike from the entrance (Pintu Rimba) to the third shelter. 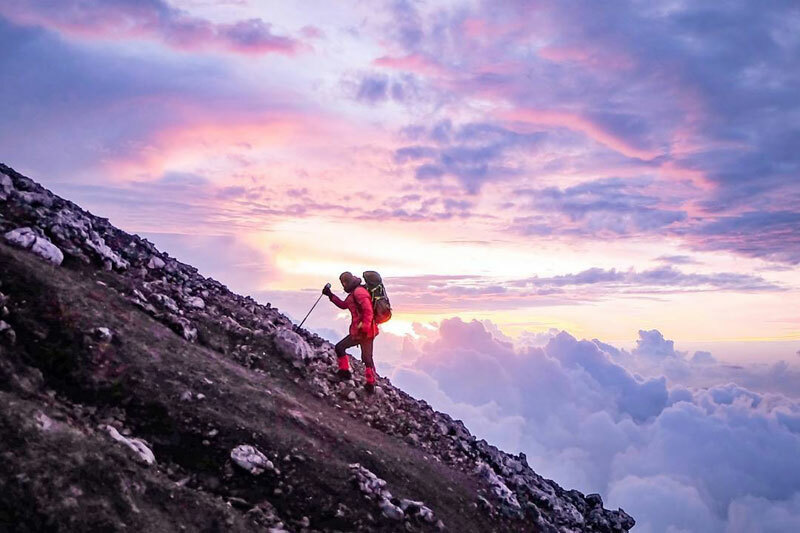 From there, you only need another 1 to 2 hours to reach the summit. This might sound difficult, but as any climber will tell you, the view is absolutely worth the challenge to get there. The sight of the clouds, hills, and valleys extending far beyond the distant horizon is worth every step. 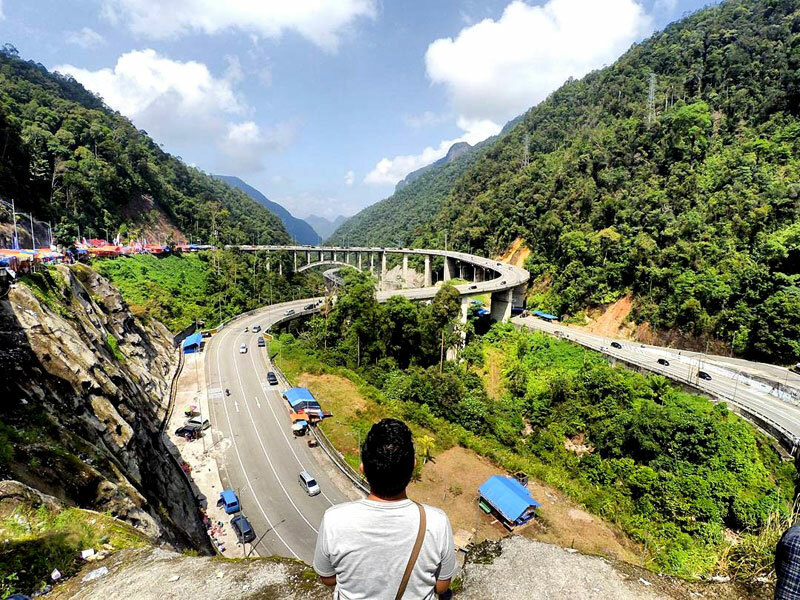 Getting There: The best route would be from Padang and take a travel minibus to Sungai Penuh region and ask to stop at Kersik Tuo village, the nearest village to the mountain, where you can stay at one of their homestays (starting from IDR 80,000 or USD 5.99 per night). If you want, you can also use a porter service for around IDR 250,000 or USD 18.72 per day. Find coordinates here. While we love waterfalls, mountain plateaus and lush greenery, we’re sure you’ll agree that sometimes, all you want is a tropical paradise! 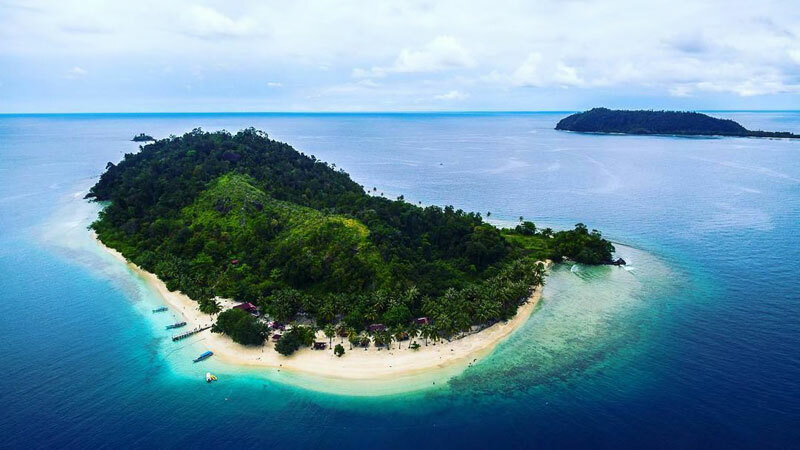 This tiny, exotic island getaway off the southern coast of West Sumatra, Pulau Cubadak, is relatively small (only 40 km wide) but boasts of a whole lot of wondrous natural attractions. 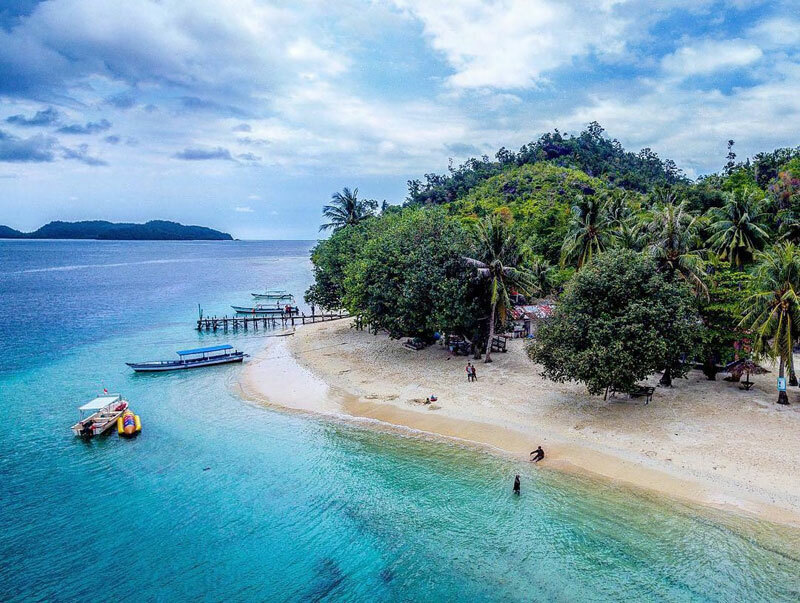 You’re sure to fall in love with the unspoilt jungles, soft, white-sand beaches (spanning 1,5km long) and magnificent underwater scenes where you can snorkel or dive your tropical holiday away – or simply float on your back as the warm, welcoming sun warms your salty skin. The island only has one accommodation: the lovely Cubadak Paradiso Resort. 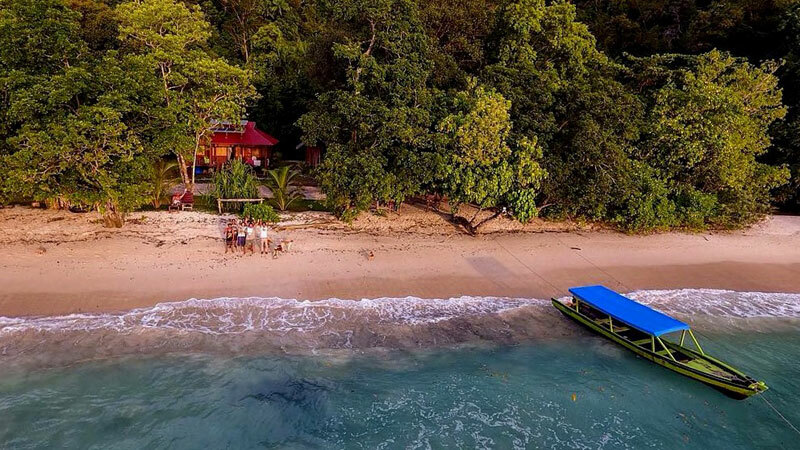 With its 14 bungalows (starting at USD 120, and one built over the water) sporting the traditional Minangkabau architecture, we’re pretty certain that you’re never going to want to leave! Getting there: From Padang drive south to the fishing harbour of Carocok (57km, or around 2 – 3-hour drive). 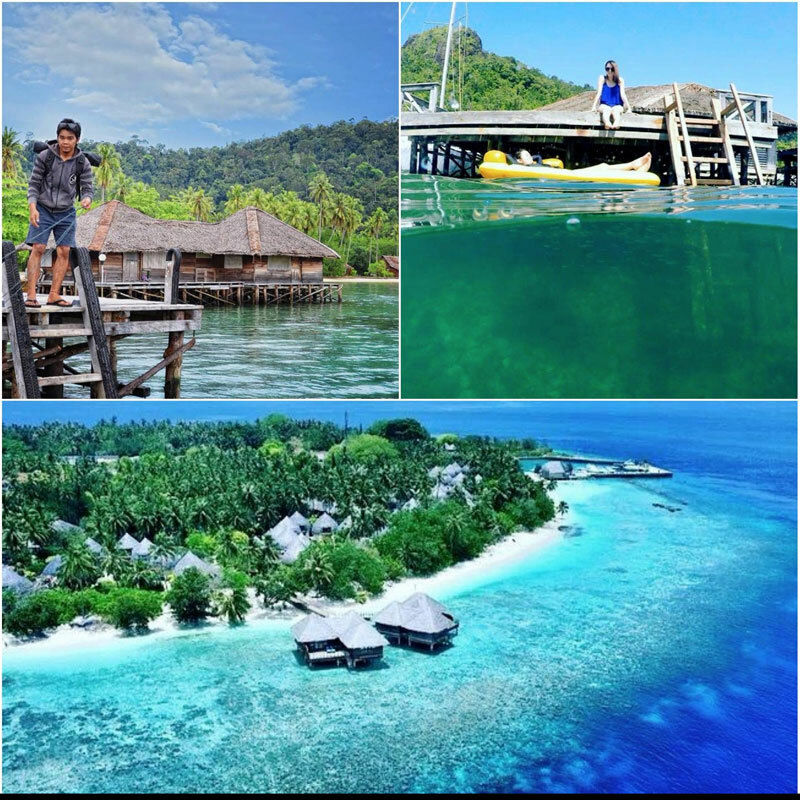 From there you take a speedboat (around IDR 150,000 or USD 11.23) for 20 minutes to the island. If you stayed at the Paradiso Resort you can arrange for an airport pick-up if you book a 3-night stay. Find coordinates here. Held to commemorate the Day of Aisyriah (the death of Muhammad’s grandson, Hussein Bin Ali, in the Karbala War), this the festival starts at 6am from the town’s plaza – so be sure to go to sleep early the night before! 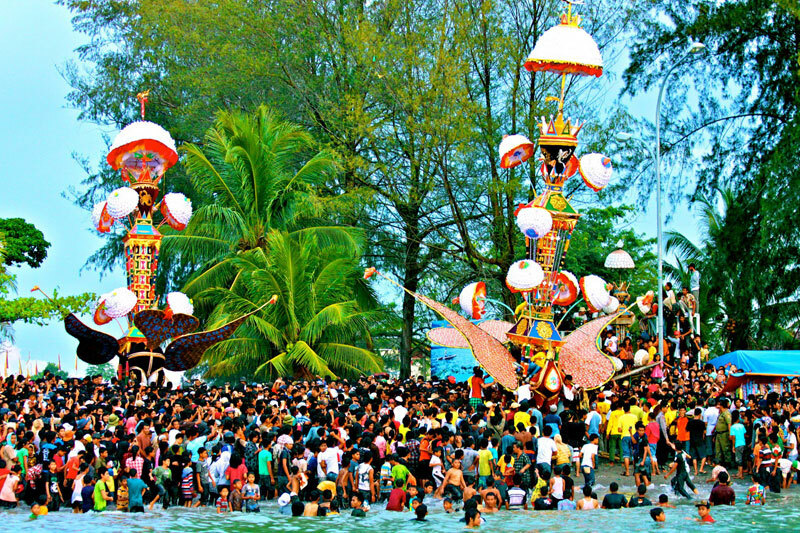 Two 12 meters-tall vertical pillars, bursting with colour, will be paraded around town to the sounds of traditional drums (gendang tasa) to energize and excite the huge crowd. Tabuik itself means wooden casket, and according to urban legend, Hussein’s casket was taken towards the sky by a mythical beast called a buraq (a winged horse with the head of a man). 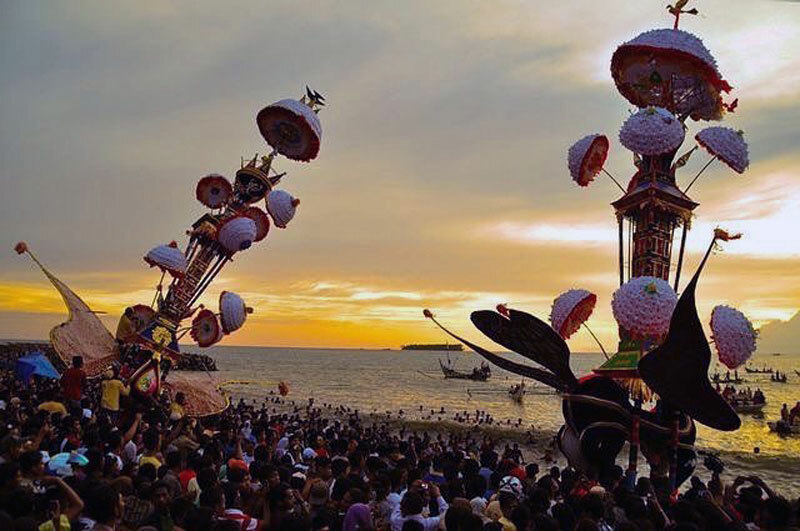 The parade ends down at Pantai Gandoriah where the towers are floated off into the ocean. If you’re in the region, don’t miss this! 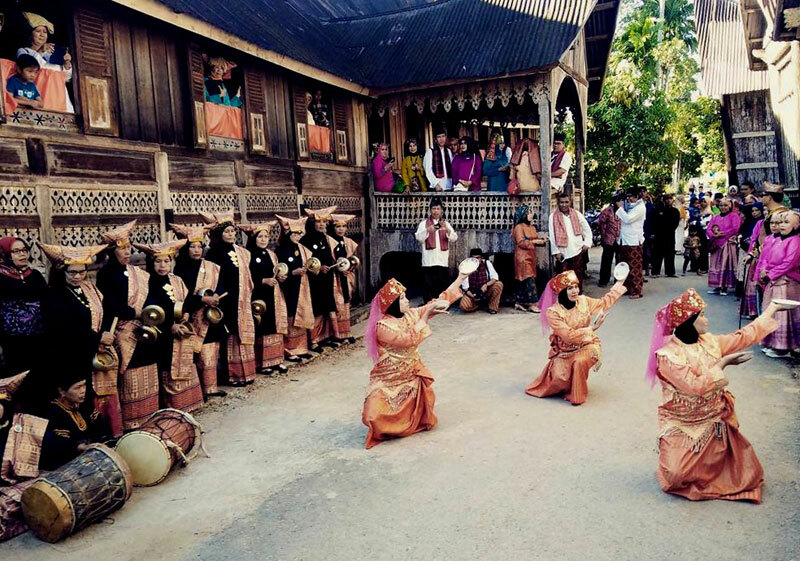 While we love mountains and waterfalls, the Tabuik Festival boasts of a colourful and exhilarating dose of culture that you can’t find in many other places! Getting there: Pariaman regency is located around 55km from Padang, or an approximately 1.5 hour trip. Find coordinates here. 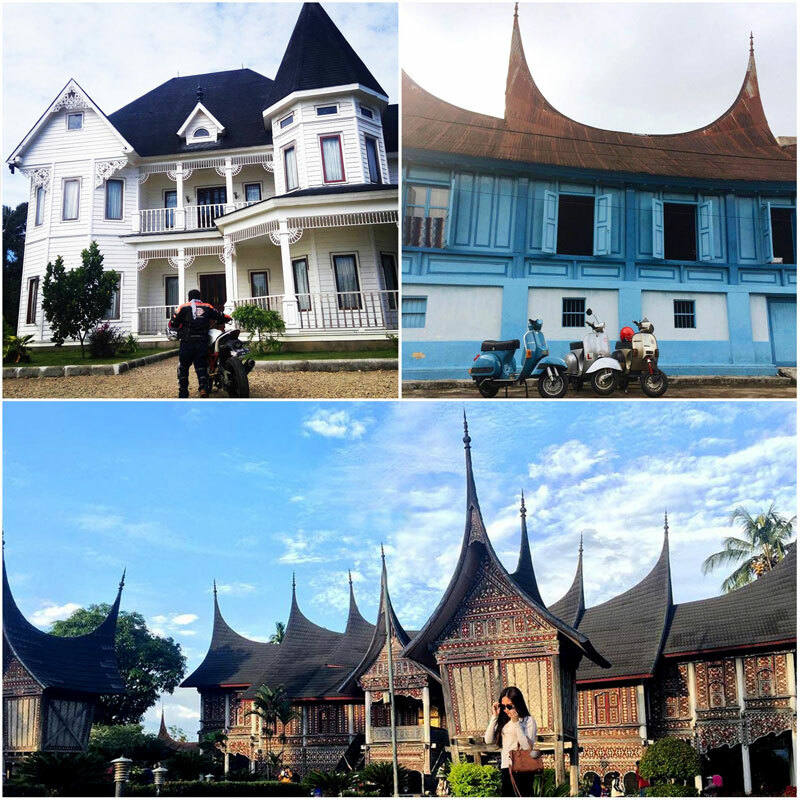 Like many other regions all over the world, West Sumatra offers delightful towns and villages with traditional and classic houses. 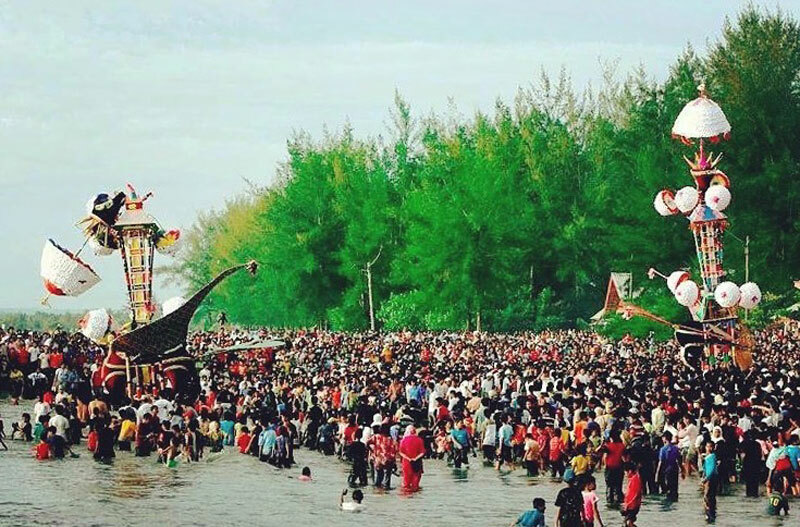 One of these is Payakumbuh, the second most populated town in the region. 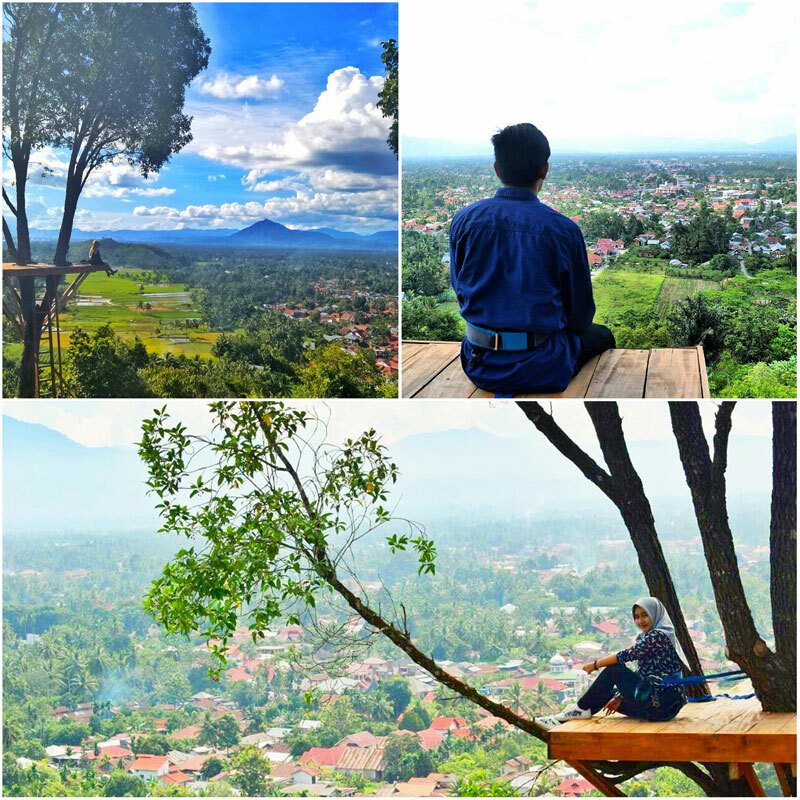 While this town that connects Padang and Pekanbaru to the northeast is relatively small, it’s by no means boring! 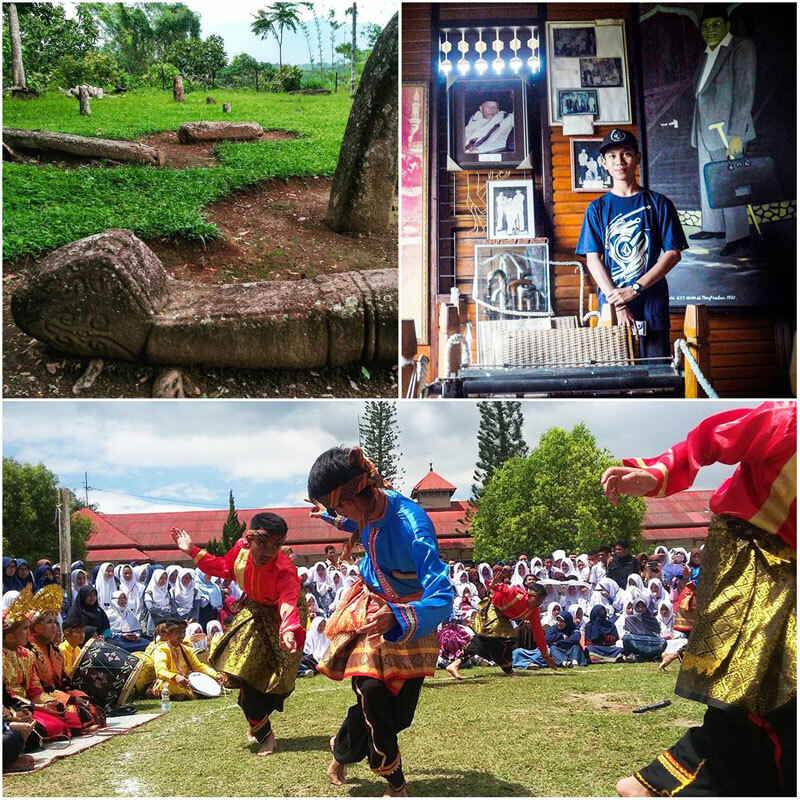 There are several unique sites you can visit to make the most of your journey through Sumatra. 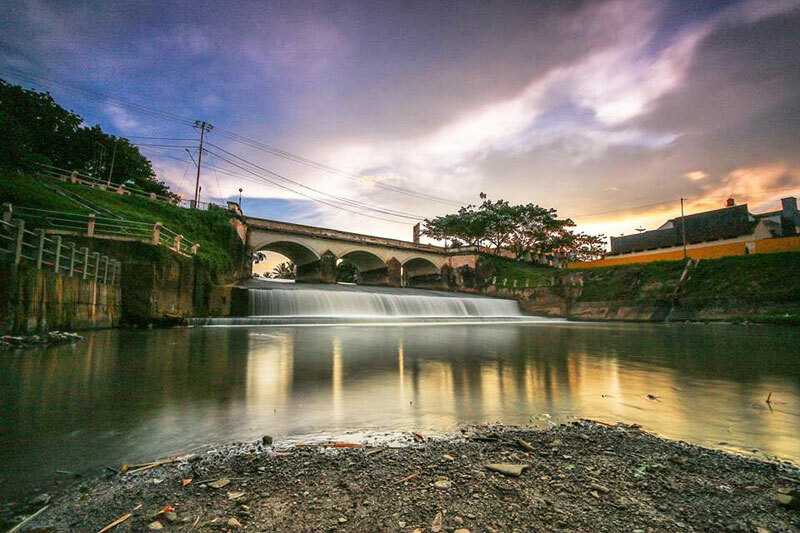 To name a few, we’re sure you’ll want to take note of the majestically-designed Jembatan Kelok 9 (great for photo-taking), or the historical Jembatan Ratapan Ibu (or Bridge of Weeping Mothers), where long ago, local soldiers were massacred by Dutch troops. If you’re a museum fan, don’t miss the Museum Rumah Kelahiran Tan Malaka, which celebrates the life of one of Indonesia’s founding fathers. 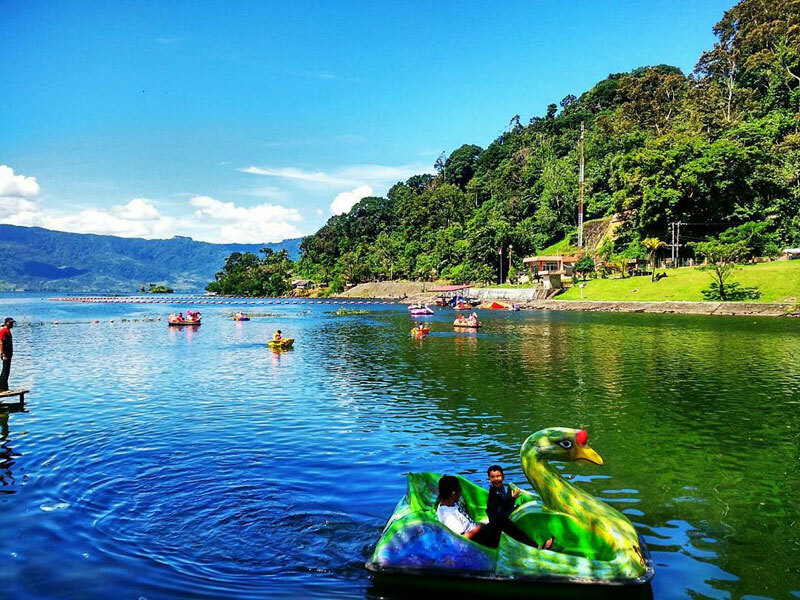 There are also flying duck races – and since its location rests on the foot of Gunung Sagu (with Mount Singgalang and Malintang decorating the panorama), the natural, lush surroundings are simply breathtaking! Another custom originating from the Minangkabau culture is an “art performance” called Randai. This form of moving art performance is indeed a sight to behold – a transfixing combination of dance, martial arts, music, and well-rehearsed choreography. If you’re a foodie, never fear! 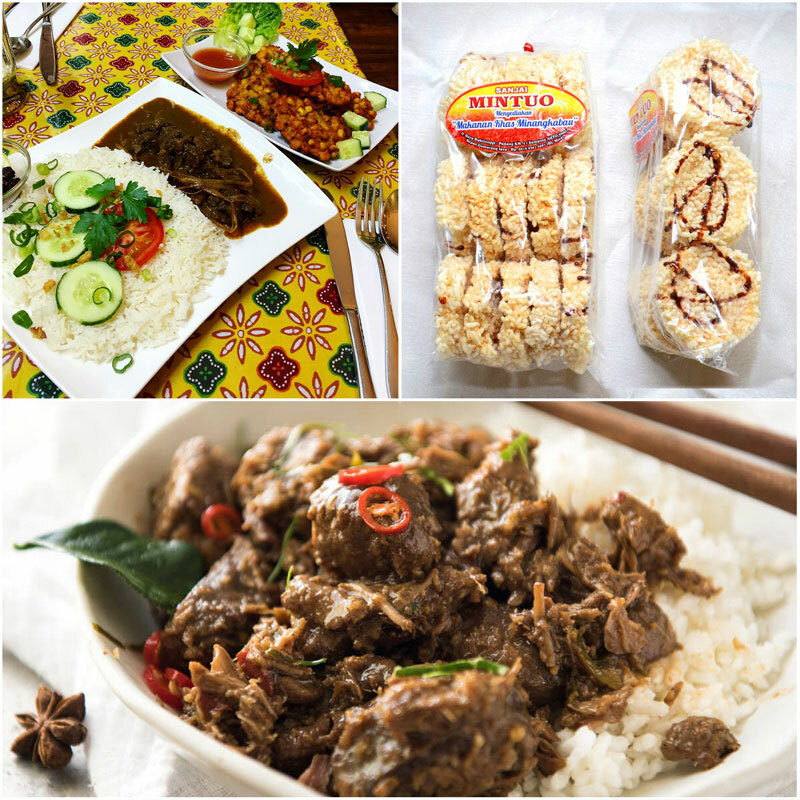 You won’t want to skip the local delicacies, like the batiah or sweet rice cookies, and, of course, rendang. You’ll never go hungry here! Getting there: There are many public buses that travel to Payakumbuh from Padang, taking around 2.5 to 3 hours to reach. Find coordinates here. 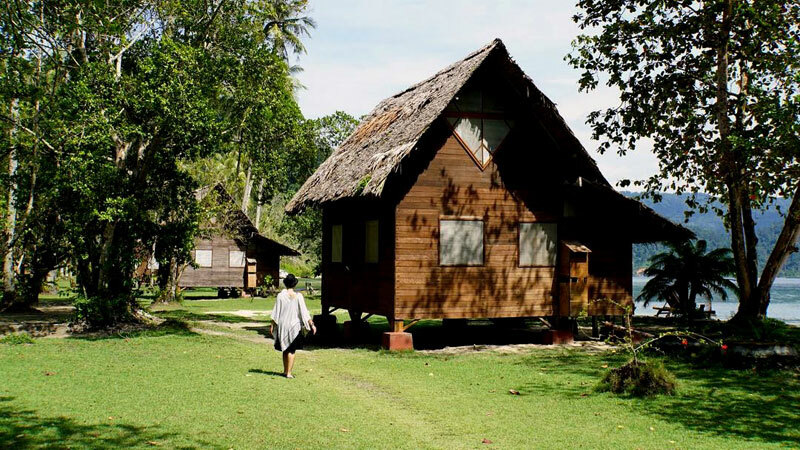 If you have a passion for traditional fashion, hop on over to Pandai Sikek Village! 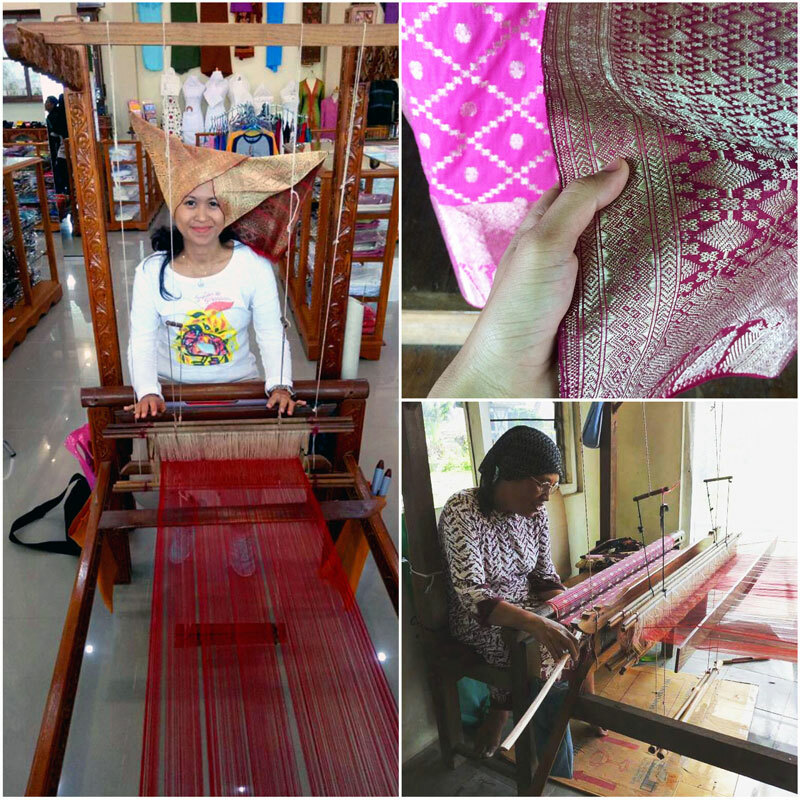 Here, you’ll find many shops offering Minangkabau’s traditional songket (or “balapak” in local vernacular), and you can even see (and learn!) 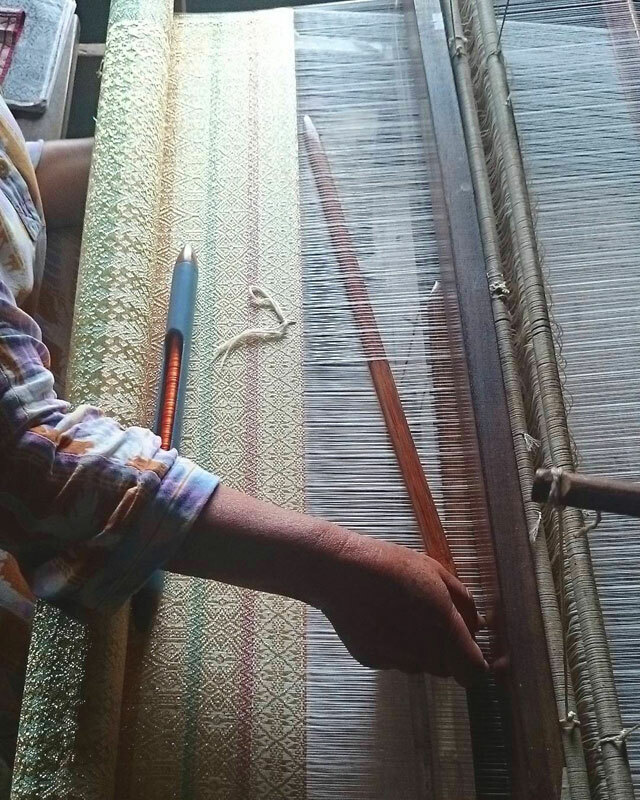 the specific fabrication process, and how the local artisans weave the handmade fabric. So not only can you learn something new – you can leave looking absolutely fabulous! The prices will vary based on the intricacies of the motifs, since more work means a higher price point. One cloth can reach up to IDR 15 million or USD 1126), but the way we see it, you can’t put a price on a truly memorable souvenir! 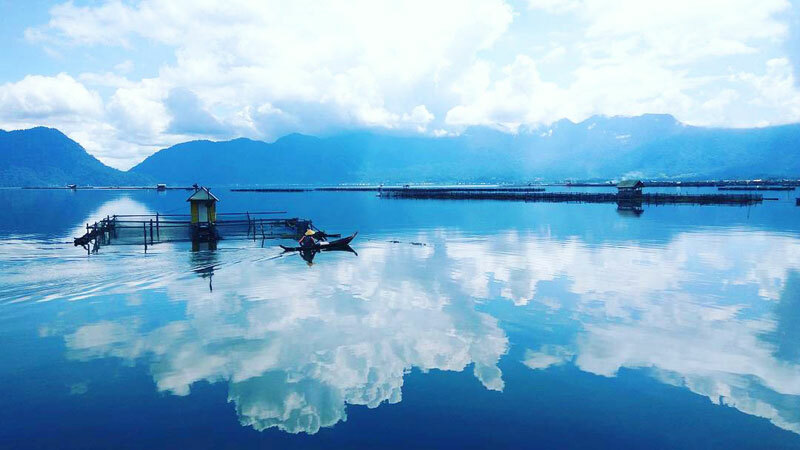 The village itself also boasts of wonderful woodcraft, and a stay in the village allows you to be surrounded by rice paddy fields and a faraway view of Mount Singgalang – overall, a truly perfect getaway! 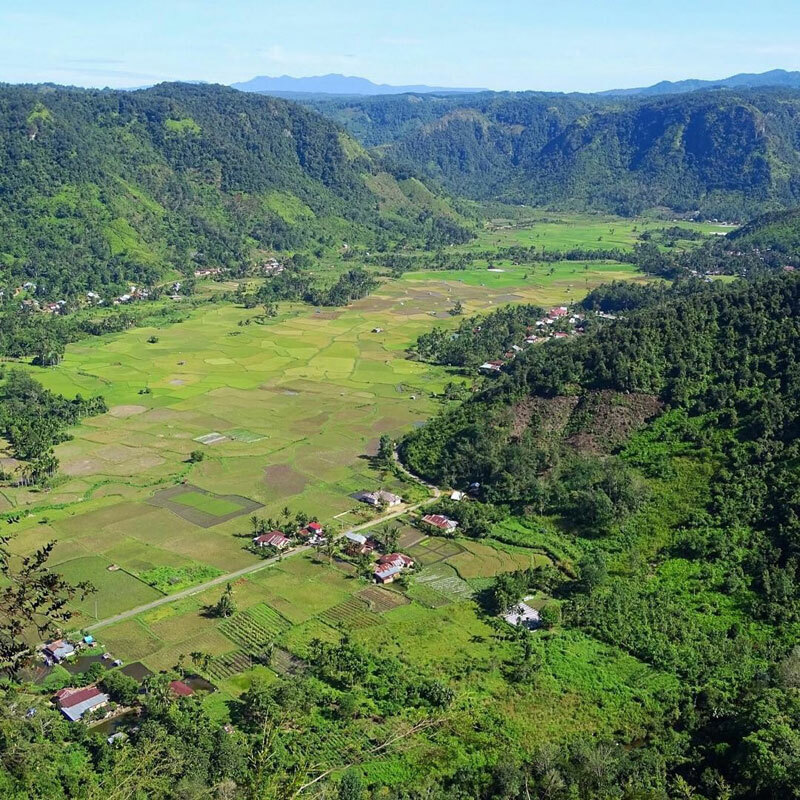 Getting there: the village is located around 15km from Bukittinggi, a 30-minute drive. Find coordinates here. Right near the entrance to the town of Payakumbuh, a little farther down the road, you’ll find another entrance to a cool green rocky “room”. 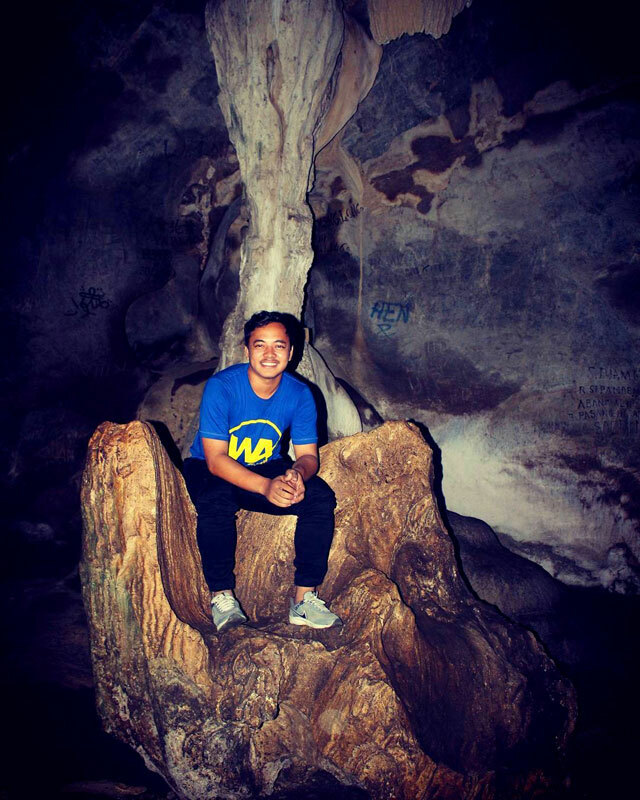 That would be Ngalau Indah, a cave with green walls. The greenery is actually due to moss covering the rocks, giving this cave a refreshing feel. You can also find stalactites and stalagmites, and if you look up, you’ll find a swarm of bats taking a nap! Careful to leave them be, however – the last thing you want is to get chased out of the caves by grumpy bats (you’d be grumpy too, if the bats woke you up from your nap)! The local management has turned this site into a family-friendly spot by adding amenities such as stairs, a bridge, a playground, and food stalls. 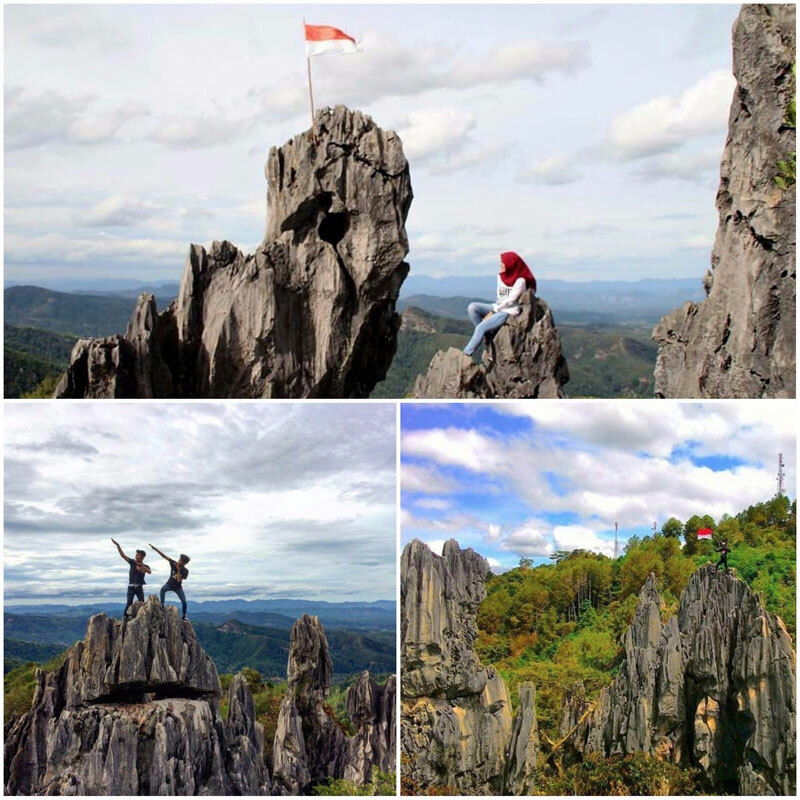 If you head to the top of the hill, you’ll be rewarded with a lovely aerial view of Payakumbuh. After all, views make for an excellent way to end the day – especially if you’re there to watch the sunset! Getting there: The site is located near the entrance of Payakumbuh. Find coordinates here. Entrance Fee: IDR 10,000 (USD 0.75) for adults; and IDR 5000 (USD 0.37) for children. 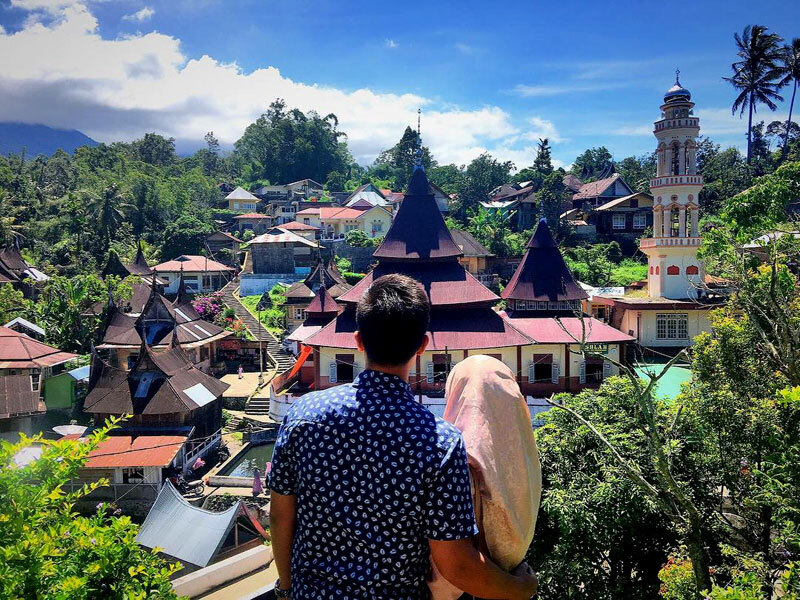 If you enter Minangkabau’s very own royal palace, you’ll discover that this picture-perfect sight could be a perfect setting for a whirlwind romance. Inside, you’ll find past royal artifacts and furniture, though we’re more smitten with the vastness of the space within with 11 gonjong, 72 pillars, and 3 floors, in which the main rooms are owned by the married princess. If you find this place jaw-dropping, you’ll be surprised to learn that it’s not an original! 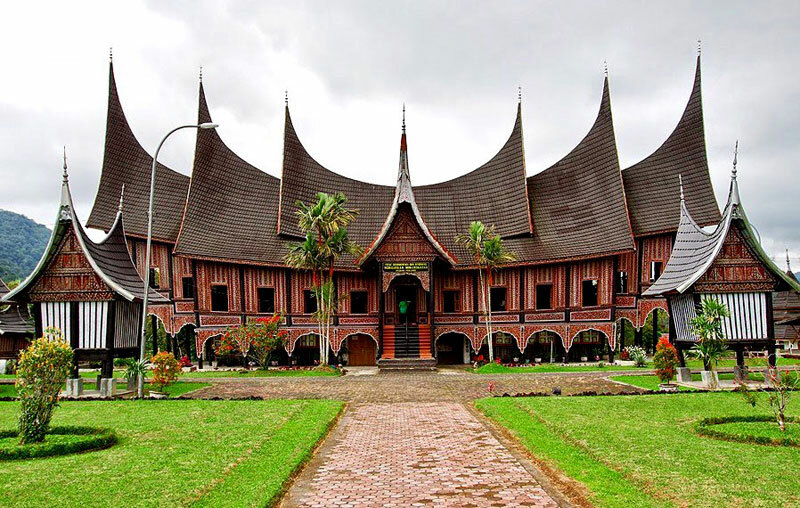 Istana Pagaruyung is actually a replica of the original palace built by King Adityawarman in 1347. It caught fire not once, not twice, but three times – first by the Dutch in 1804, then again in 1966 and in 2007, the latter due to lightning. Though it is a replica, the structure is true to original architecture, displaying the stunning pointed roofs famous to this region. Be sure to grab pictures while you’re here; these structures are unique and not something you’re likely to find outside of Indonesia! Address: Jalan Sultan Alam Bagagarsyah, Batusangkar, Tanah Datar (find coordinates here). Entrance Fee: for local, IDR 7000 or USD 0.49 (adult) and IDR 5000 or USD 3.70 (children); while for foreigner, IDR 12,000 or USD 0.84 (adult) and IDR 10,000 or USD 0.70 (children). Hours: Monday through Sunday, 10:00 am to 4:00 pm. If you’re looking for perfect photography spots, then look no further! 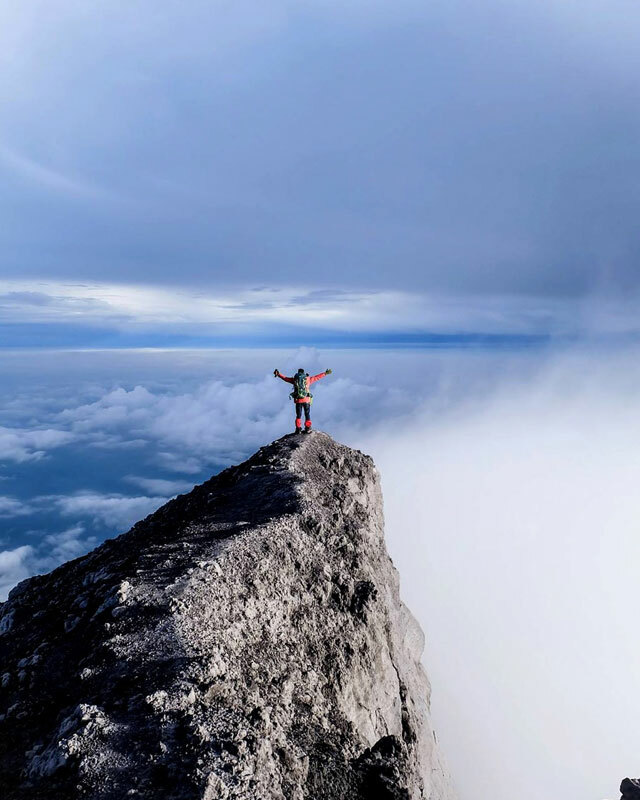 A picturesque village sitting at the foot of Mount Merapi, Nagari Pariangan has been dubbed as one of the most beautiful villages in the world by a U.S. travel magazine. 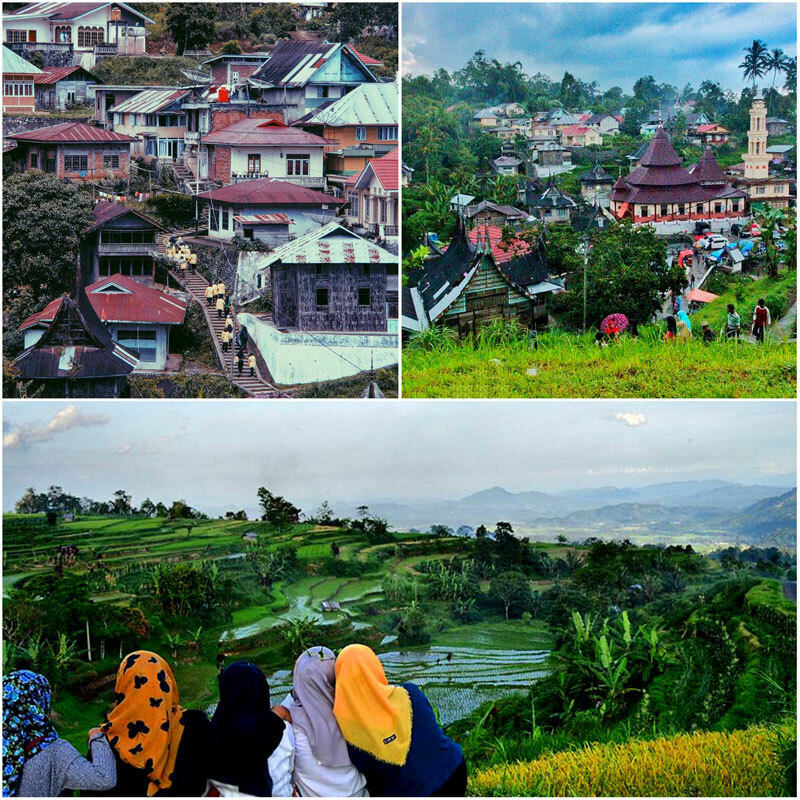 The title is very well-deserved – surrounded by lush trees, sloping rice paddy fields, and beautifully preserved Rumah Gadang, the small village is built on steep land and overall only covers around 18 km wide. 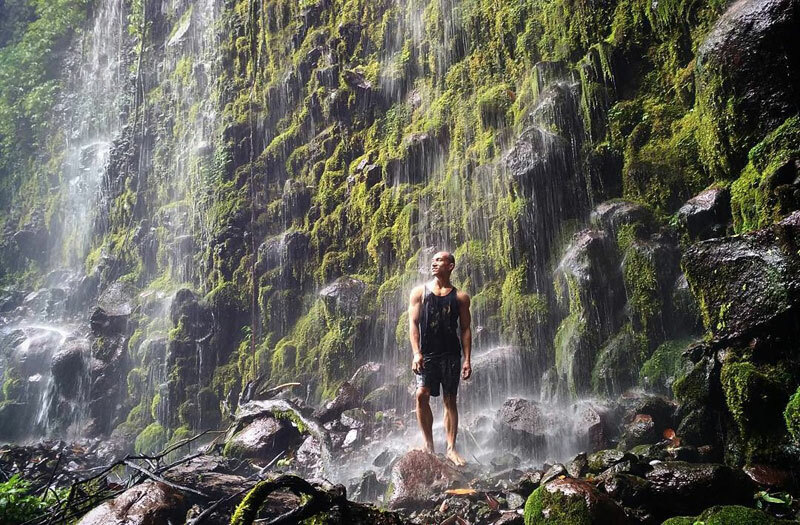 Due to a nearby active volcano, there are natural hot springs nearby that locals enjoy as a popular past-time. This is a great spot to relax and melt your troubles away! Nagari Pariangan is considered to be the oldest village in West Sumatra, and is therefore hailed as the origin of the Minangkabau culture. In fact, a rice paddy field called Sawah Gadang Satampang is now designated as a cultural heritage spot, being the first paddy field ploughed by their ancestors. One thing for sure, this location is not only culturally important and enriching, but beautifully stunning as well! Getting there: From the town of Batusangkar it’s another 13 km to reach Nagari Pariangan. Find coordinates here. 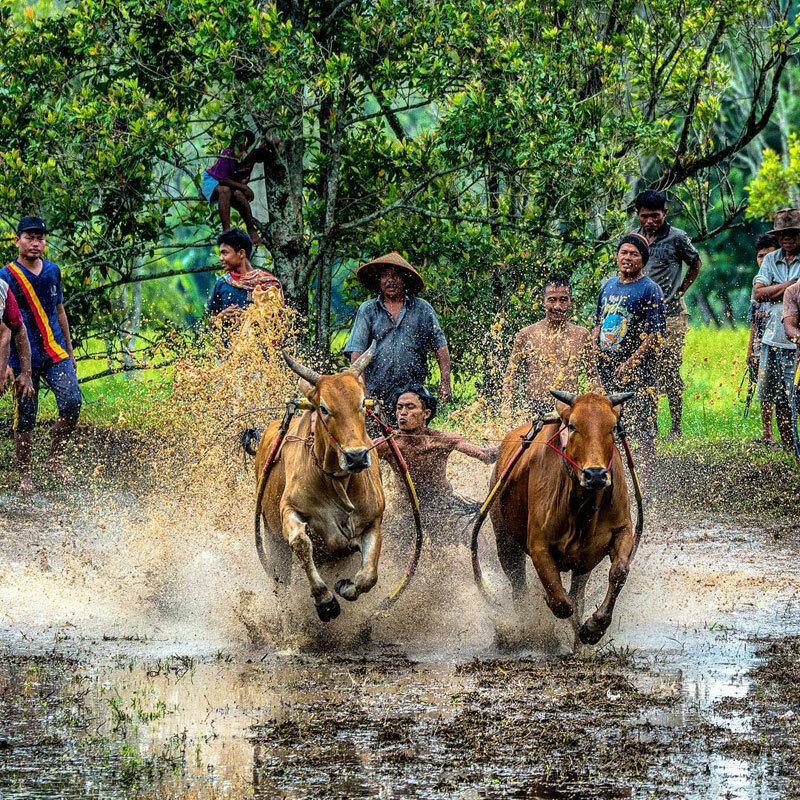 Similar to Pacu Jawi, the festivities that occur at Kubu Gadang Village in Padang Panjang are held just after the harvest season. 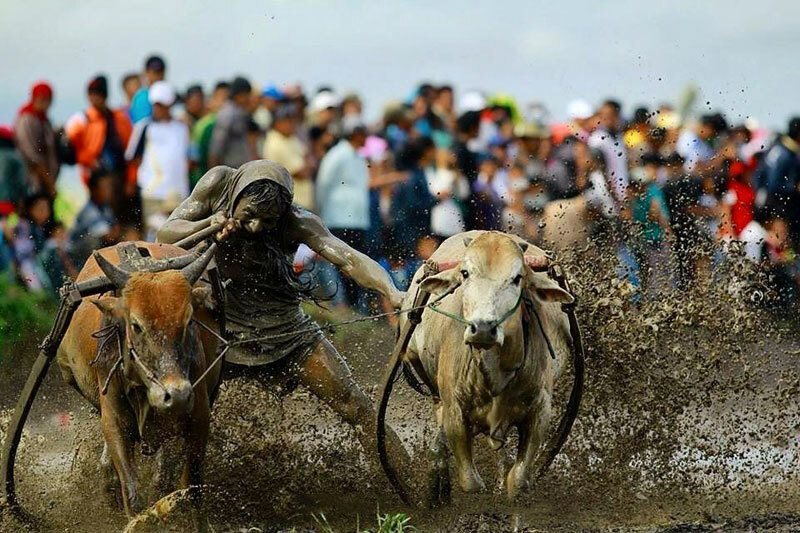 Instead of bull racing, though, get ready for a fascinating martial arts performance (still performed in the mud though!). 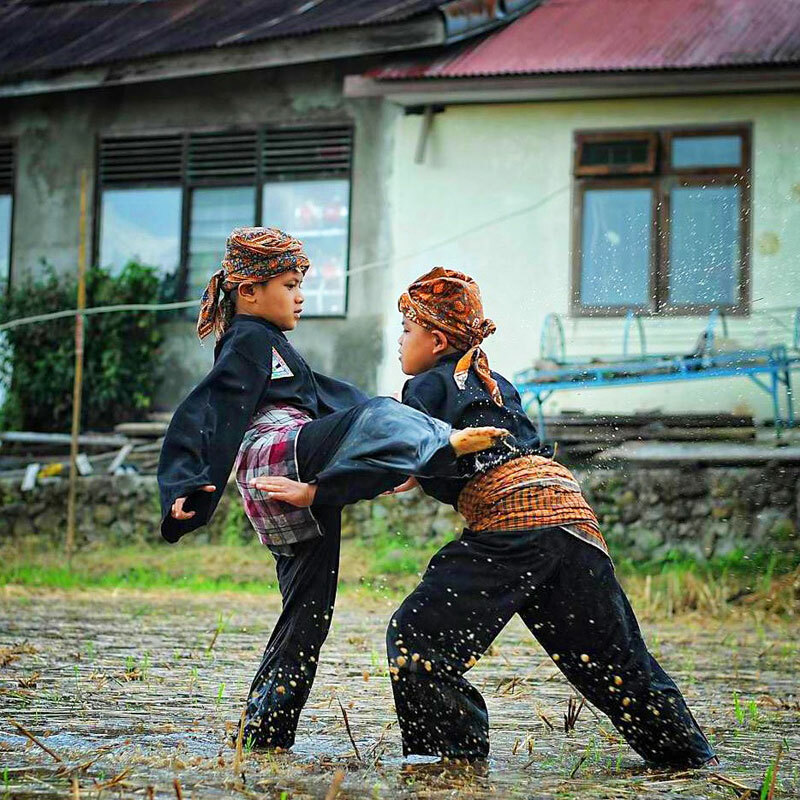 Though the village is designated as a kampong wisata, or tourist village (located 1.5 hours from Padang), the martial arts (called pencak silat) are significant for the indigenous Minangkabau and are still performed by the young locals who grew up in the village. And it is exciting! Practising a type of silat called Silek Lanyah, the duellers will throw punches and swing their kicks on watery or muddy post-harvest field. Someone cast these people in an action film, please! 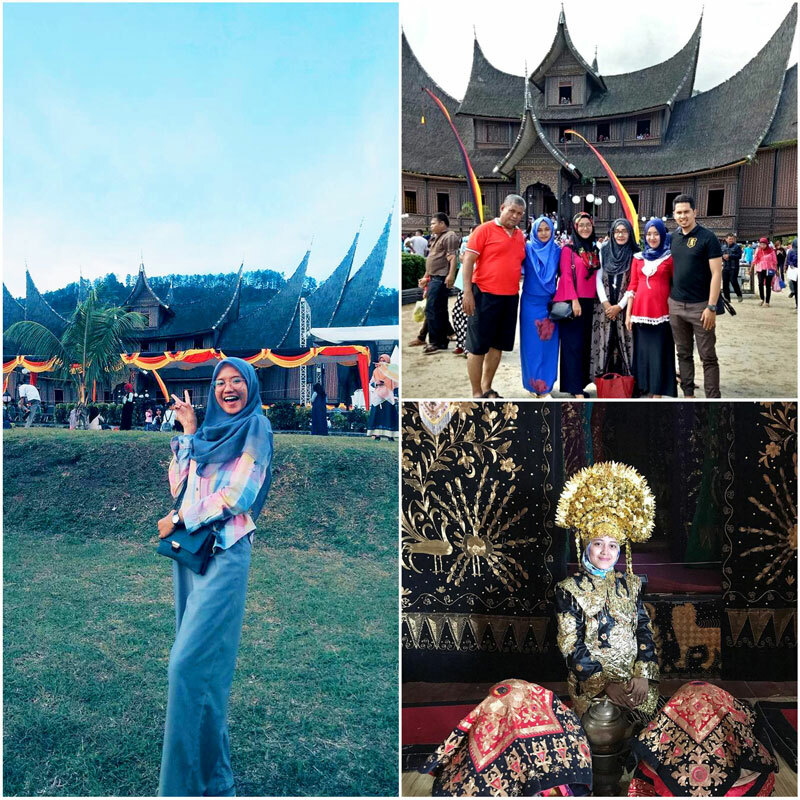 In West Sumatra, there’s just so much to see, smell, taste and experience – stunning architecture, fascinating cultures, delicious food, and natural vistas that will leave you breathless. You might never want to leave!